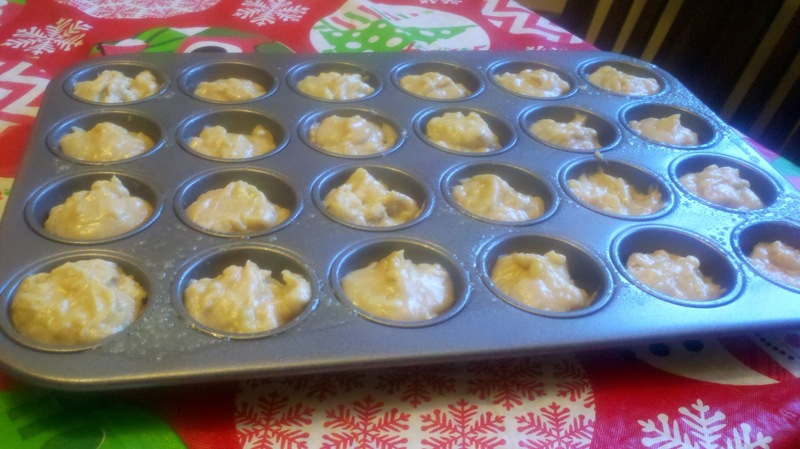 Well, I made it into muffins, but close enough. 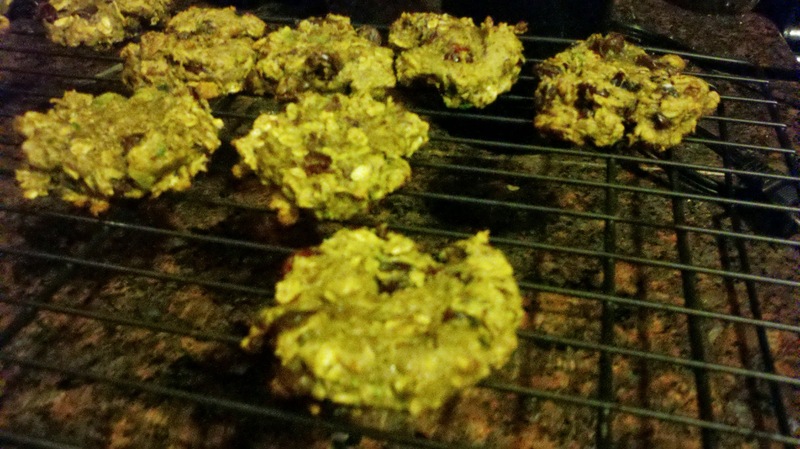 And I liked this recipe so much that I sent it to my brother (he asked for it)! To make it clear how big a deal this is, I’ve never seen either of my siblings bake something besides a frozen pizza or a box of au gratin potatoes. 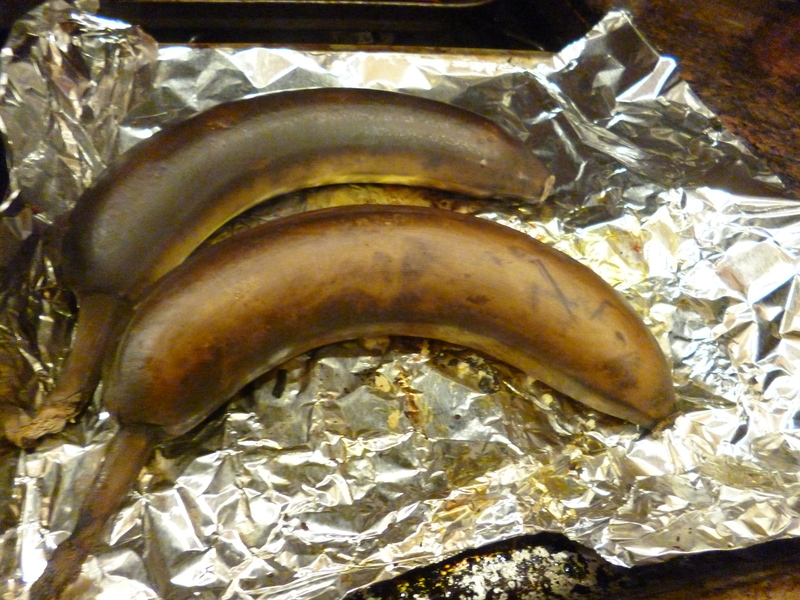 Anyways, when visiting my brother’s house in California as a wonderful respite from our polar vortex, I noticed he had three very brown bananas sitting on the counter. 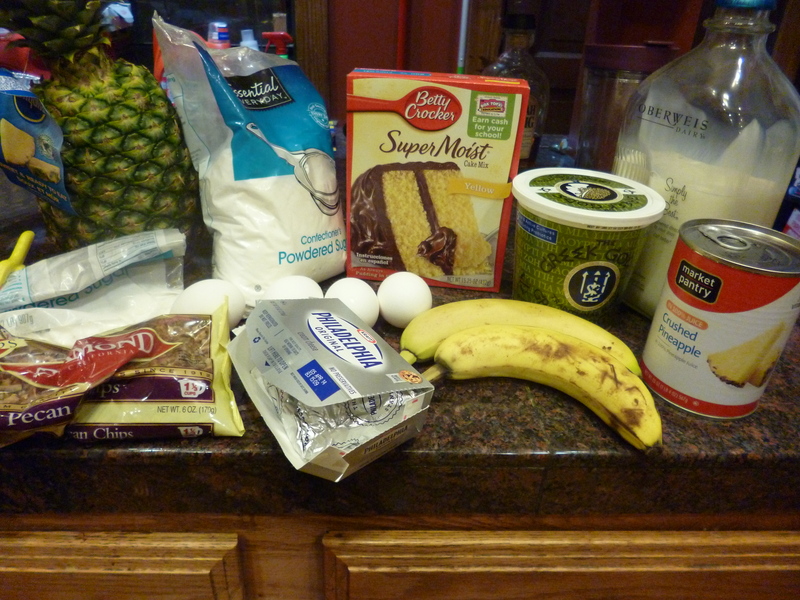 Obviously, time for banana bread! Always delicious and easy. And my favorite: one big bowl and a little one only! Can you SPOT the main difference between this picture and this one? I’ll give you a hint: it’s in all caps in this caption. 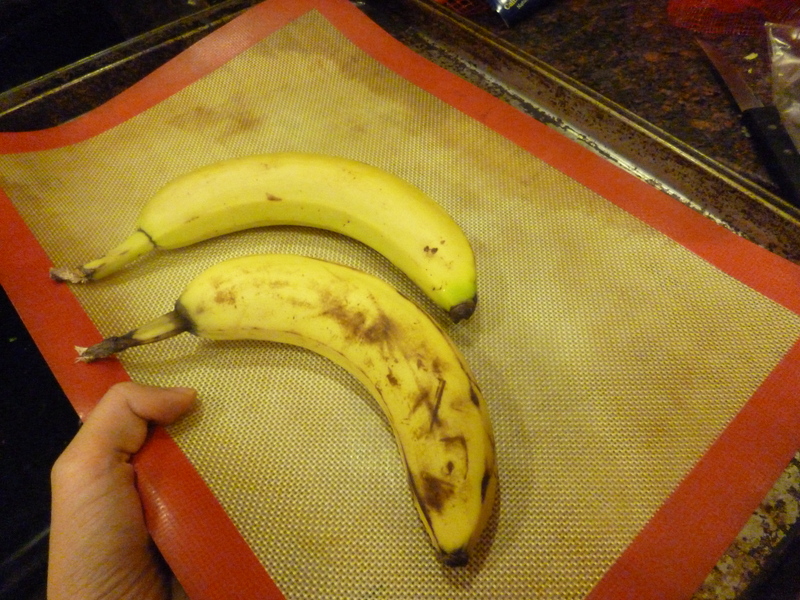 Dark brown/spotted bananas are very sweet and mushy, so great for banana baking (I’ve also used mashed bananas to lower the amount of sugar in a recipe). 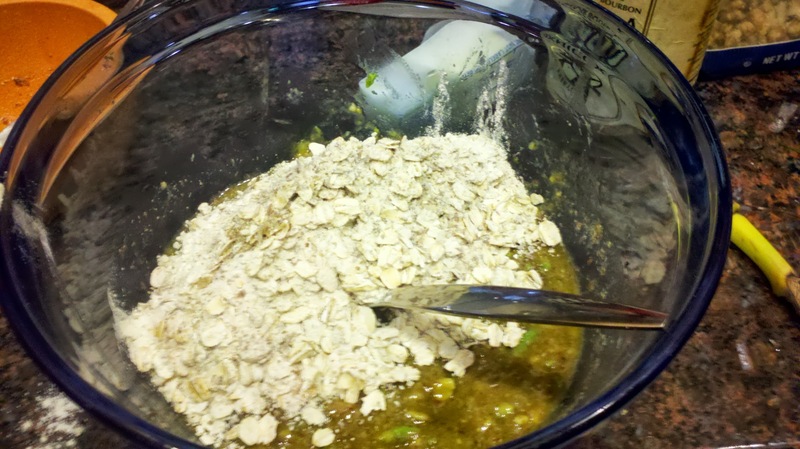 Plus they’re so easy to mash! 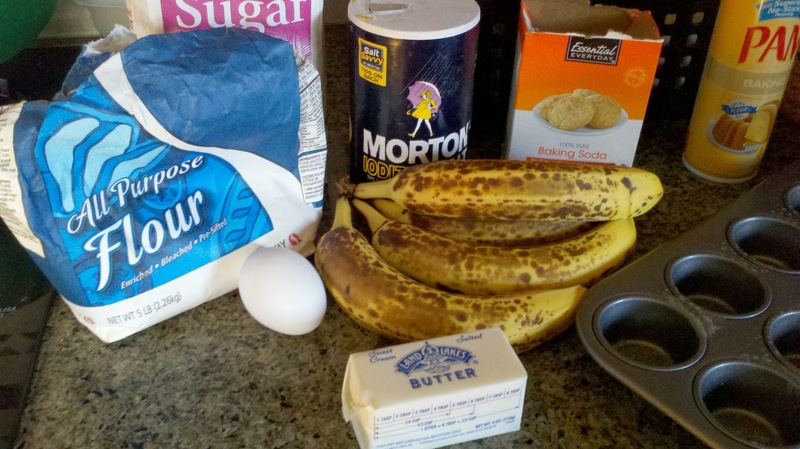 I was going to make a double batch, but Santa Claus came by earlier and I decided to encourage his healthiness by giving him bananas instead of cookies. So you aren’t seeing the FOUR Nick ate. Maybe I just wanted to make a dirty pun. 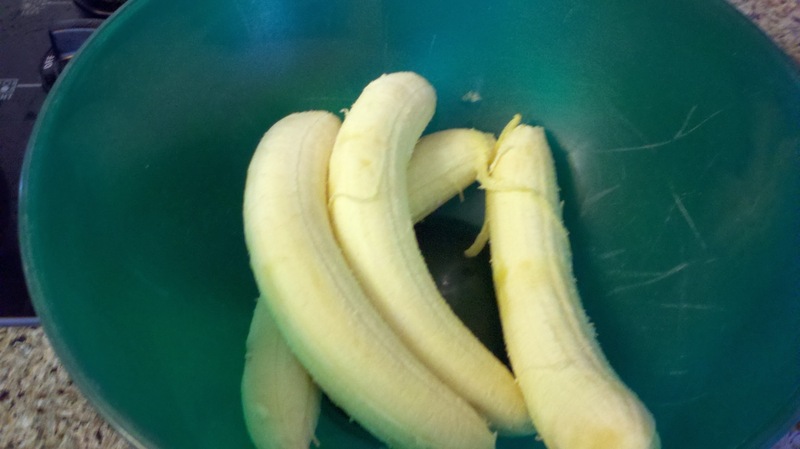 I invited Bruce Banner to come by and fork these bananas for me. I was just curious if, after the Hulk comes around, he points at everything he did and yells HULK’S MASH! 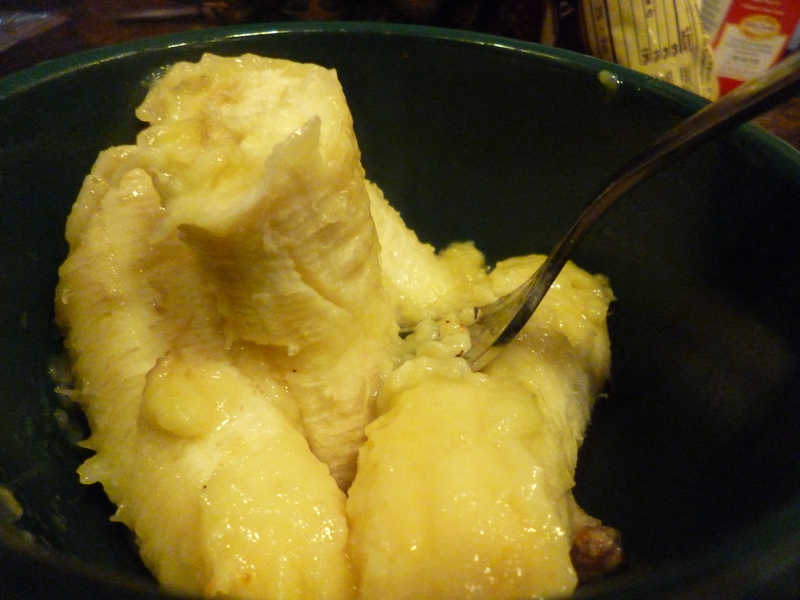 So you start by mashing the bananas, then mix in some melted butter (melting it takes the small bowl). BETTY BOTTER IS FROM 1899. 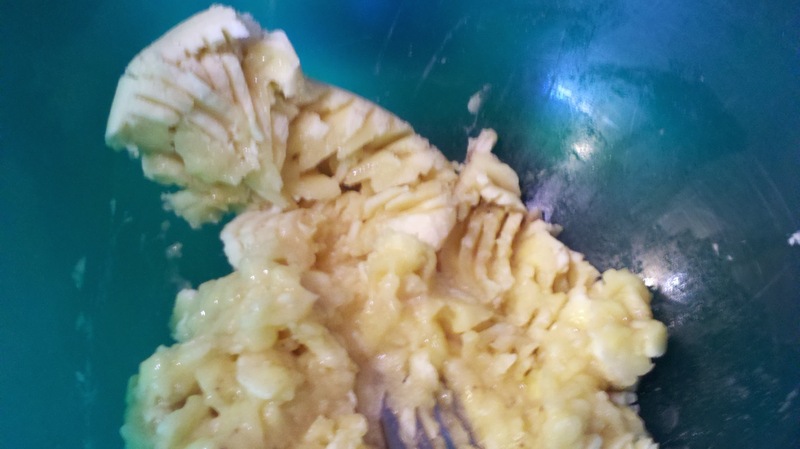 In case you’re not aware who Betty Botter is, she’s most famous for putting approximately this amount of a superior version of this product into her batter, hence making it better. 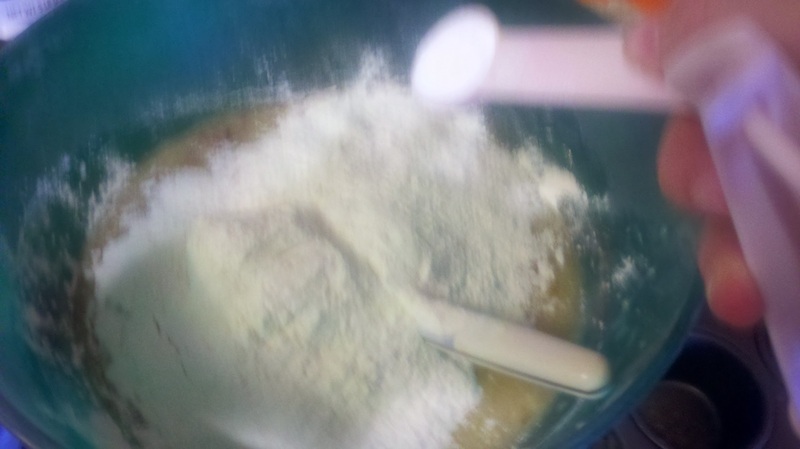 Beat an egg in the now vacant bowl, and add that along with some sugar (I went with less) and a dash of vanilla (I forgot this and the world didn’t explode). 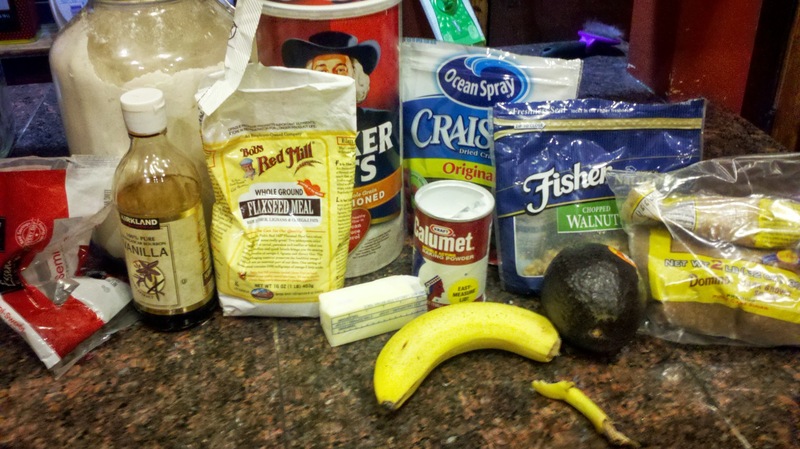 It seems to cost more and more for ingredients these days… guess you could call it a bowl market. 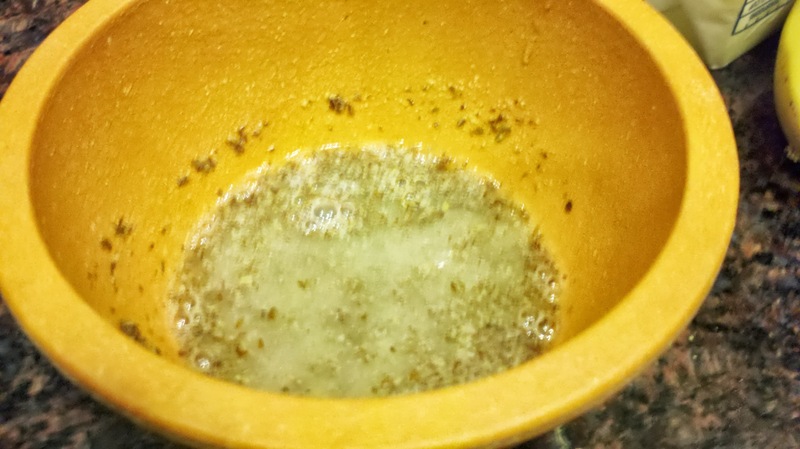 I love that one of the lines from the recipe is “Sprinkle the baking soda and salt over the mixture and mix in.” Because most times recipes required you to whisk these guys into the flour before you add it, which is such a pain (requires another bowl). 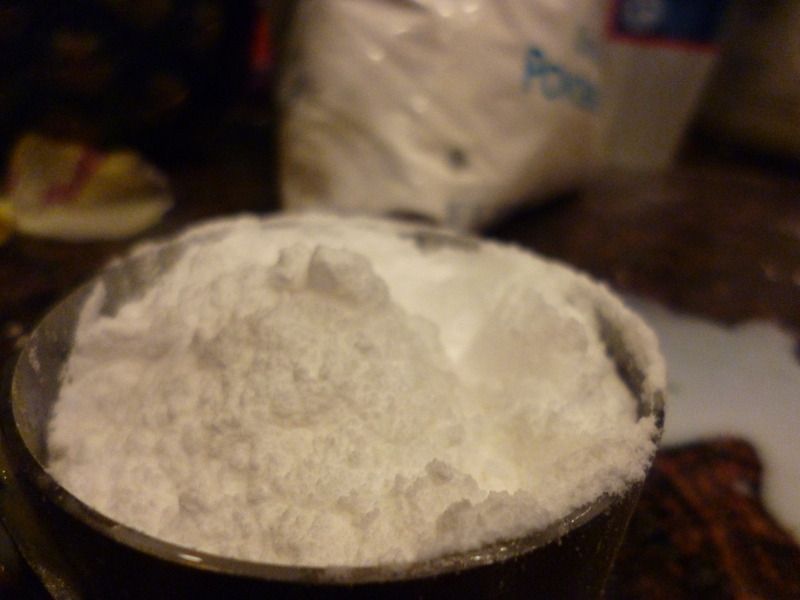 It does avoid pockets of baking soda/salt, but so does sprinkling! Mix all that up. My brother and sister in law own this Pam baking spray stuff. I’ve never used spray fats (I like my olive oil and butter and lard and I throw them in all my food generously), but this was AMAZING! WOW! So easy to grease the pan! I forgot to take an action picture, but rest assured it was incredible. I think it’s important, if you go this route, to get the ‘for baking’ one or else your stuff will taste like olive oil or whatnot. 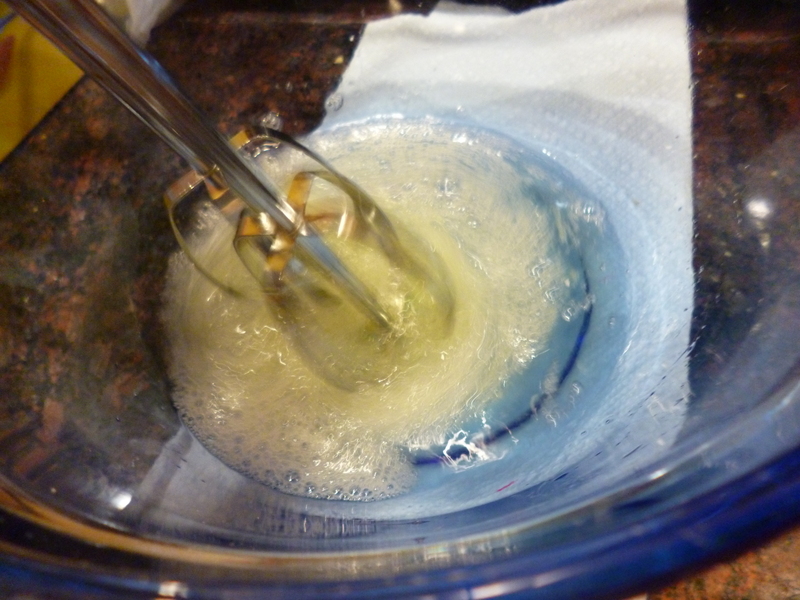 Generally when greasing pans I wipe around a pat of butter, because that is delicious, or some vegetable oil (olive oil has too strong a flavor for greasing, in my opinion). 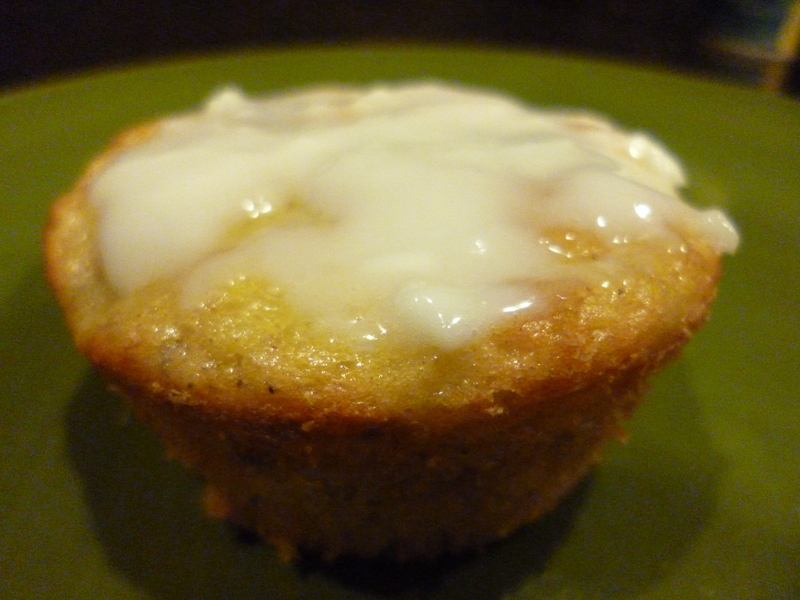 I put a heaping 2 TB of batter into each mini muffin spot. I was looking for one of these pans for myself the other day, and searched for “4 x 6.” Then realized that I was in the postcard section of the store. 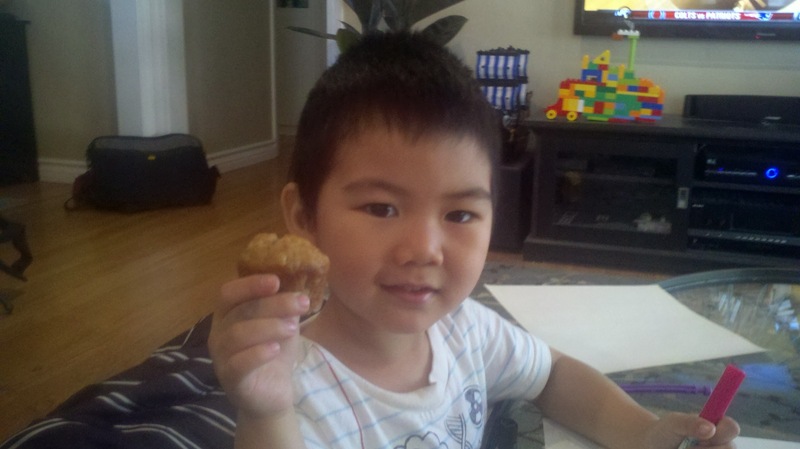 And my adorable nephew showing one off! 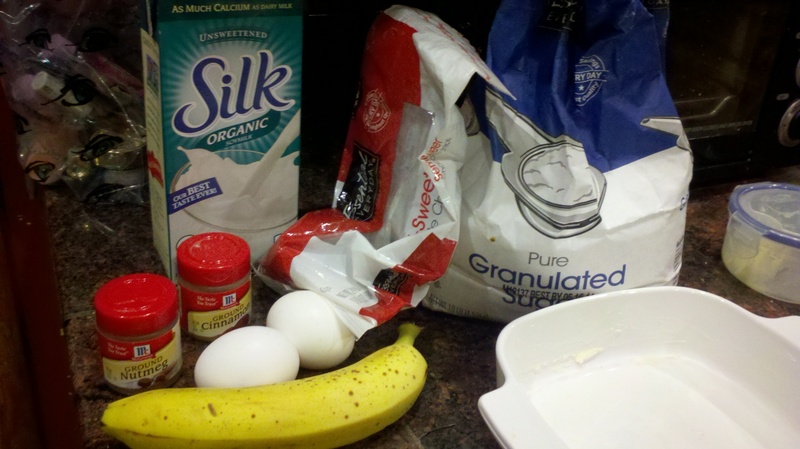 Quick and easy banana bread recipe from simplyrecipes. 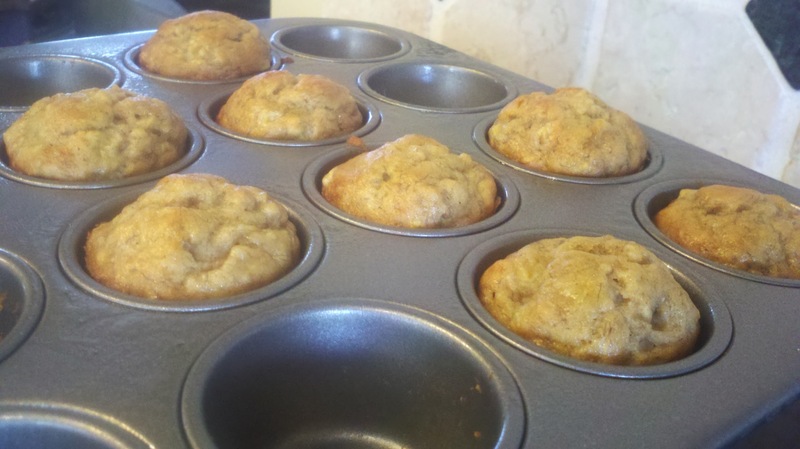 All I did differently was bake mini muffins for 20 minutes instead of an hour for the loaf. I figured since I did no doctoring I should just link to the original: here it is again. Darn it it’s been nearly two weeks since my last post! A first in the history of this blog. My only excuse is that I have been fighting off a crazy cold (there was also finals and travel but that’s not really an excuse). Today is day 16 since I first felt that little throat-tickle thing, and I’ve been sleeping a ton, drinking lots of water and chicken soup, and loading up on Vitamin C and self-pity. Anyways. Here’s a post! 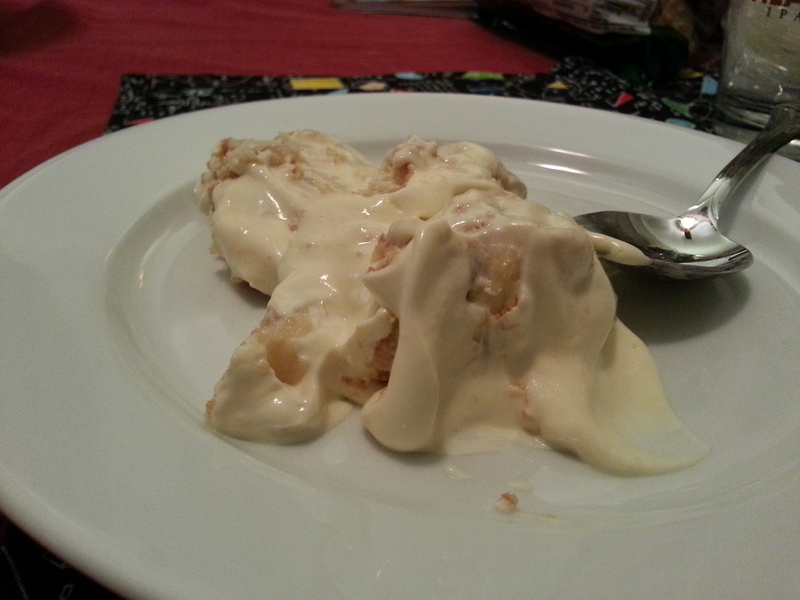 I adore banana pudding. It’s not a dessert I grew up with- the first time I had it was in the college dining hall. In fact I can probably count the number of times I’ve had it on one hand, which is sad because it’s SO GOOD! 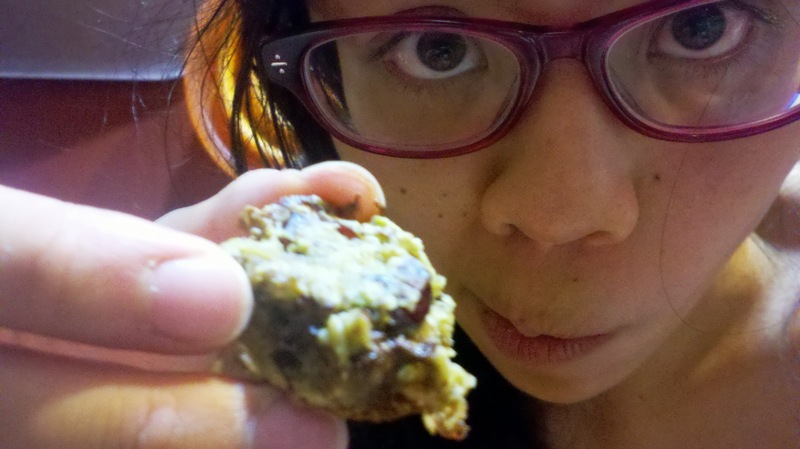 The cookies turn cake-like when soaked in pudding, and the weird goopy consistency of bananas works perfectly with the other components. Apparently it’s a big thing in the South… I hadn’t heard of it when growing up in Minnesota and California, while my boyfriend was incredulous of my less than or equal to 5 times (he’s from North Carolina). We also didn’t have kudzu. 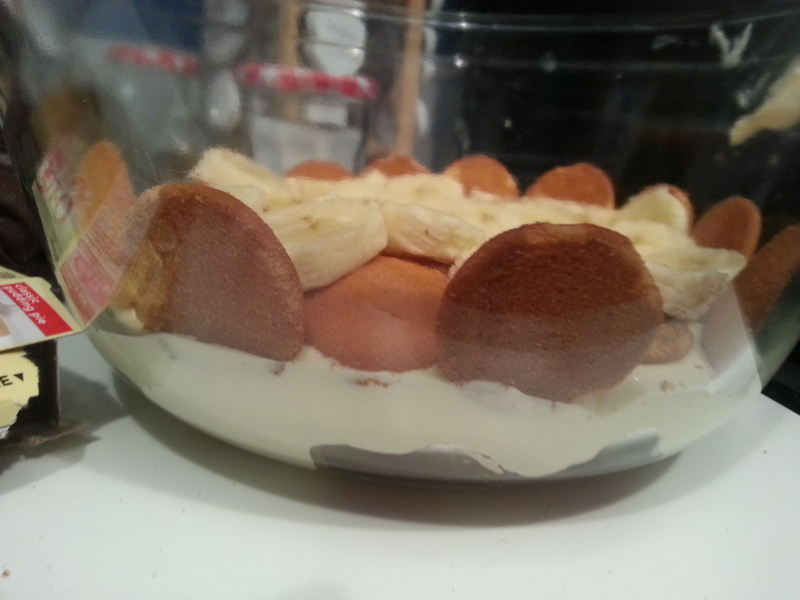 You know that I love pudding in all its forms so it shouldn’t be a surprise that I made this. What is surprising is that I haven’t made it before. I live by a fantastic independent coffeeshop (it was in the nytimes once!) that does signature less-coffee-ish drinks every season. I’m still dreaming of a lemon and rose and cucumber soda they did the summer I moved here. This fall, the drink was the Cosby Classic, which was a latte that tasted exactly like banana pudding, complete with a Nilla wafer on top. 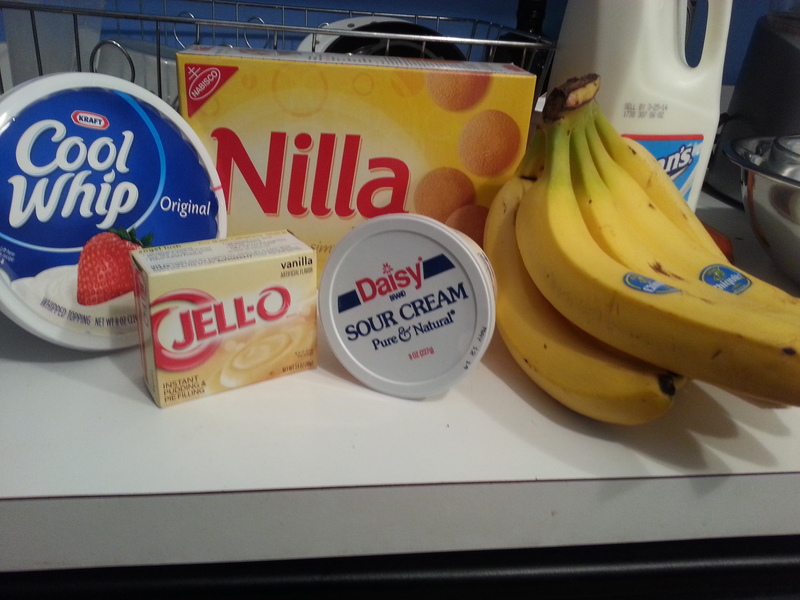 So of course I immediately walked to the store down the street and picked up ingredients for banana pudding, which meant Nilla wafers and bananas. There’s always rum for rum! Because rum sounds like “room,” sort of. 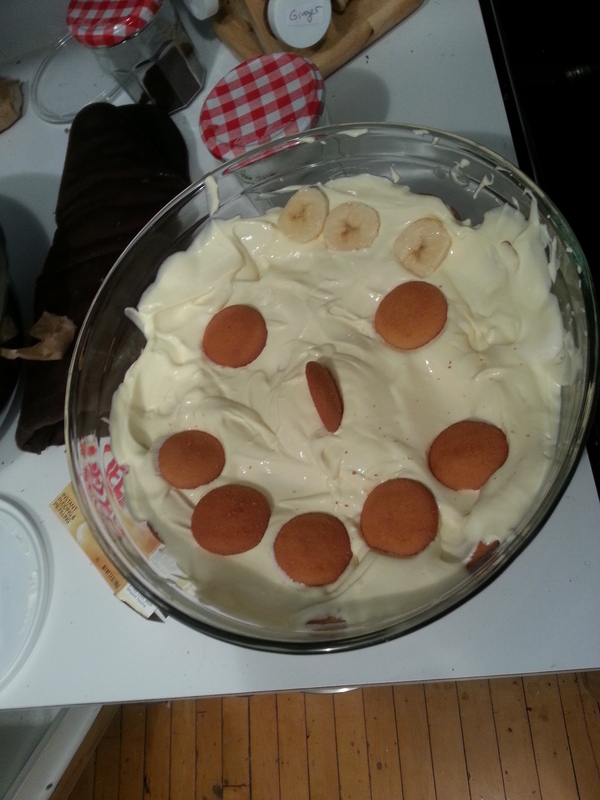 Lots of banana pudding recipes on the internet are a little disgusting, probably still delicious. 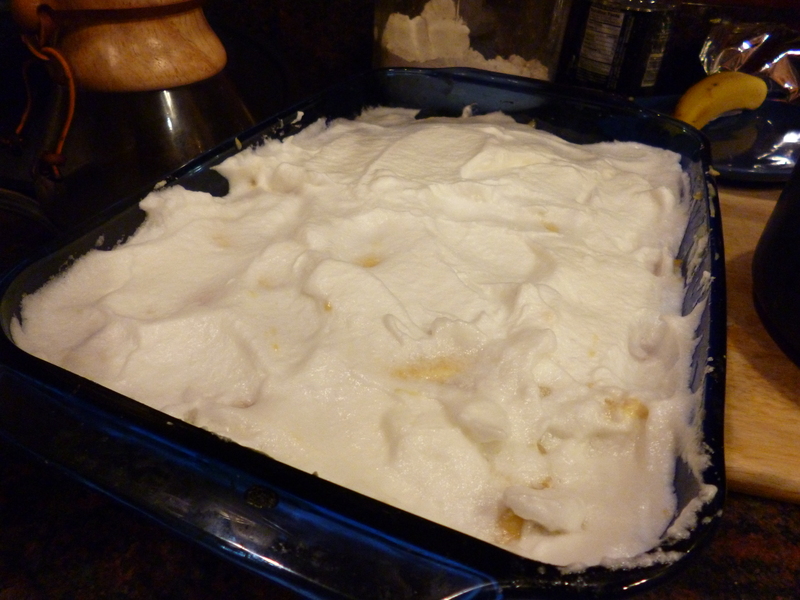 For instance, this one has you beat an entire package of cream cheese with a can of condensed milk, instant pudding mix, other stuff, and half a container of cool whip. I’m all for cream cheese (love scrambling it with eggs after a workout! 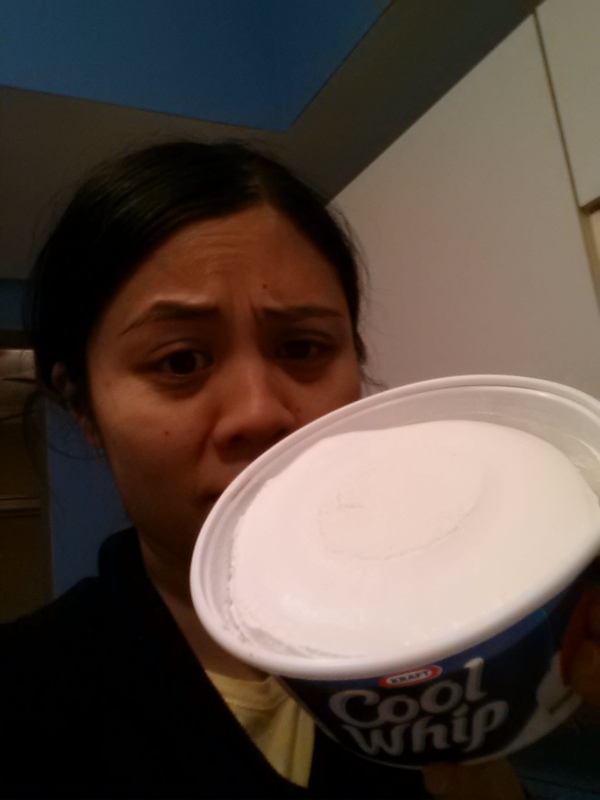 ), and condensed milk (I am Vietnamese after all), so I’m pretty sure it’s the container of “frozen whipped topping” that makes me go ICK. 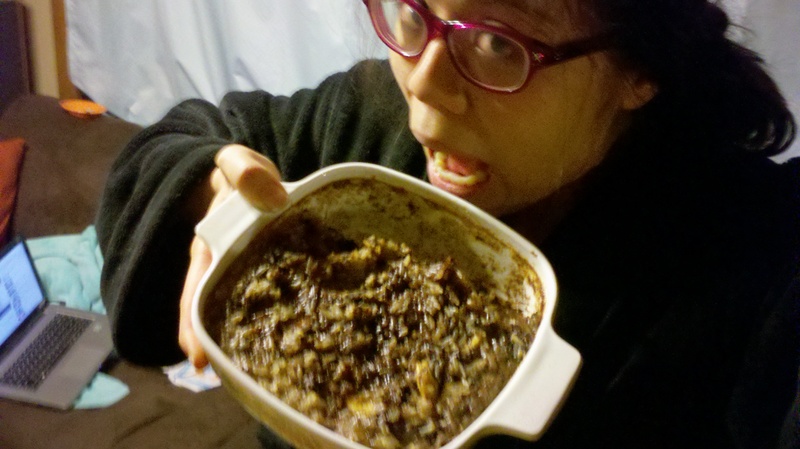 It’s also a ridiculously popular recipe so I’m sure it’s wonderfully delicious. I was tempted to get instant pudding mix, but go big or go home, right? This is me taking risks and grabbing life by the pot. Sigh. 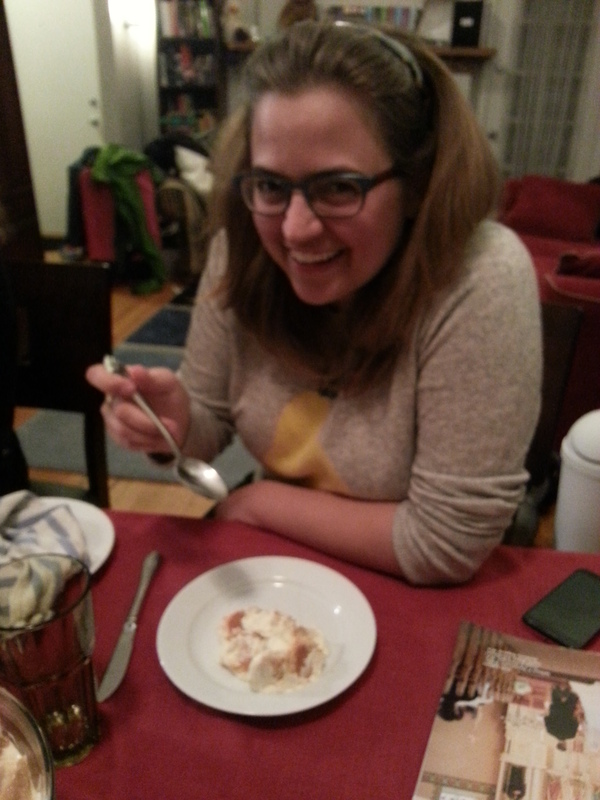 Hyperbole aside making homemade pudding was definitely my adventure of the week. 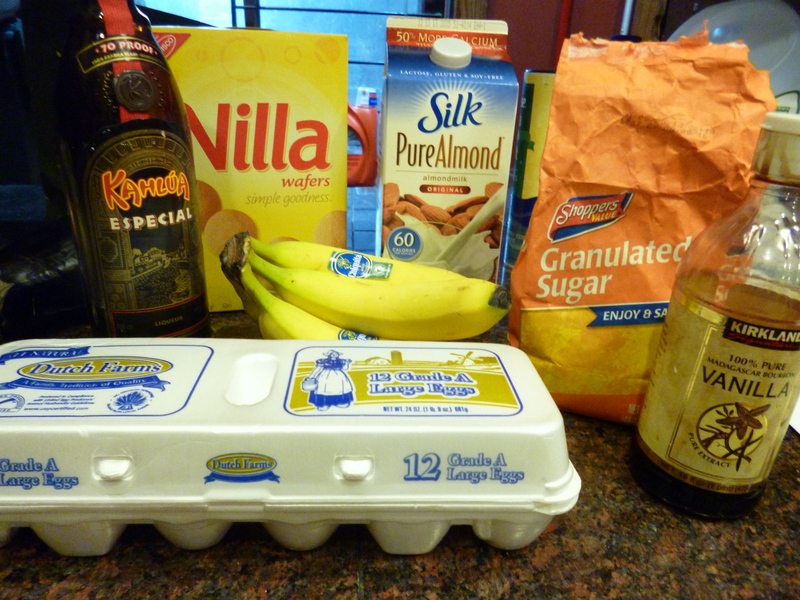 I mostly followed the recipe on the back of the Nilla wafers box, plus a recipe from the internet that I cannot find right now but will keep looking for! 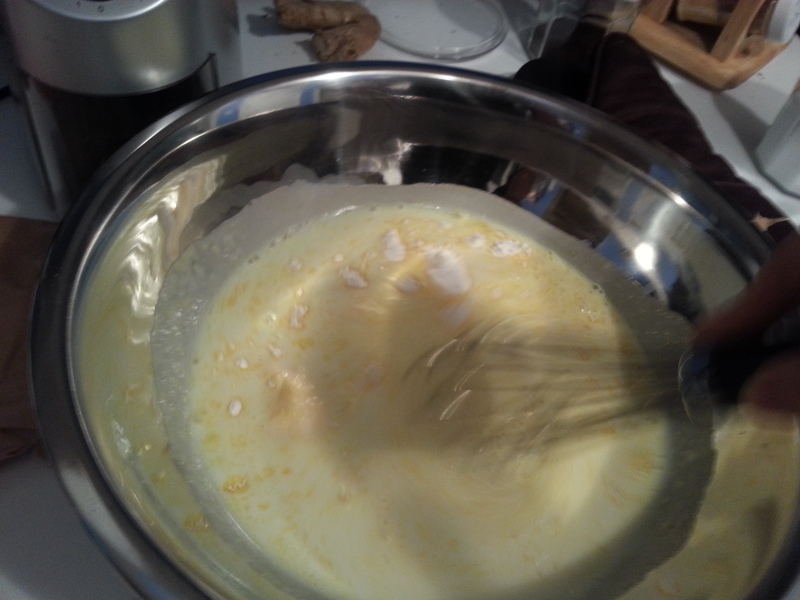 Separate the whites from the yolks so we can make the meringue topping. 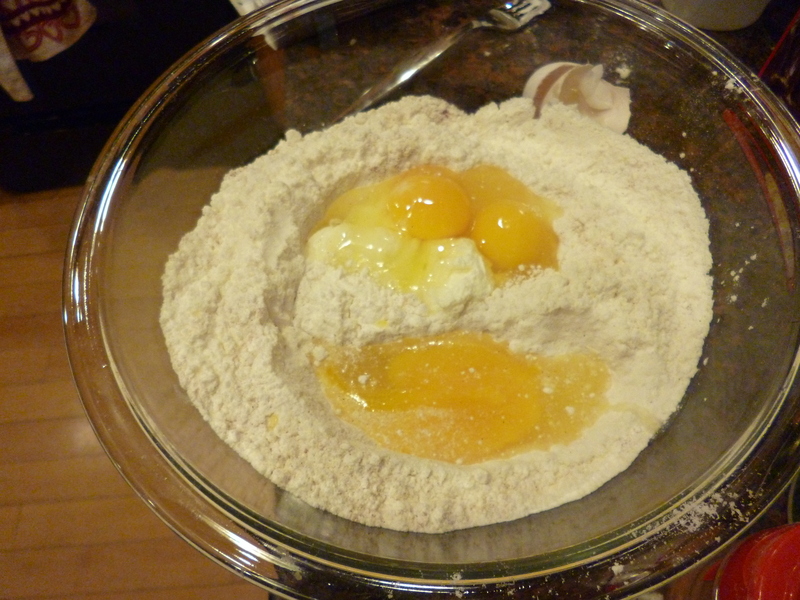 Then mix the yolks with the flour and sugar. 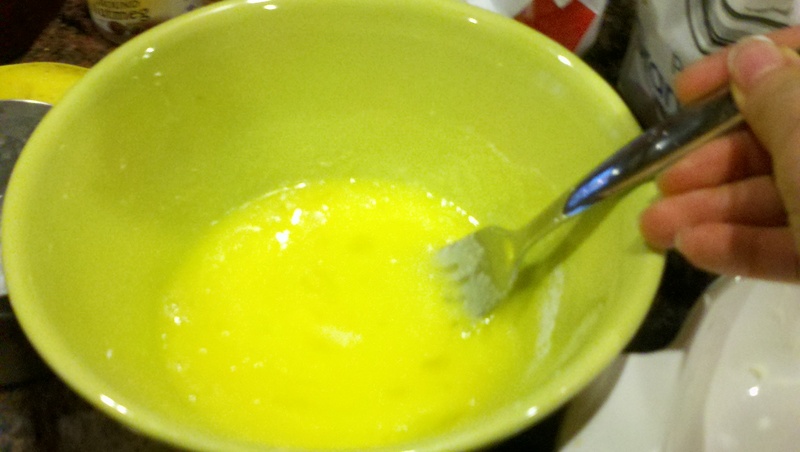 We’ll use hot milk to temper the eggs so we don’t get pieces of scrambled egg in our pudding. 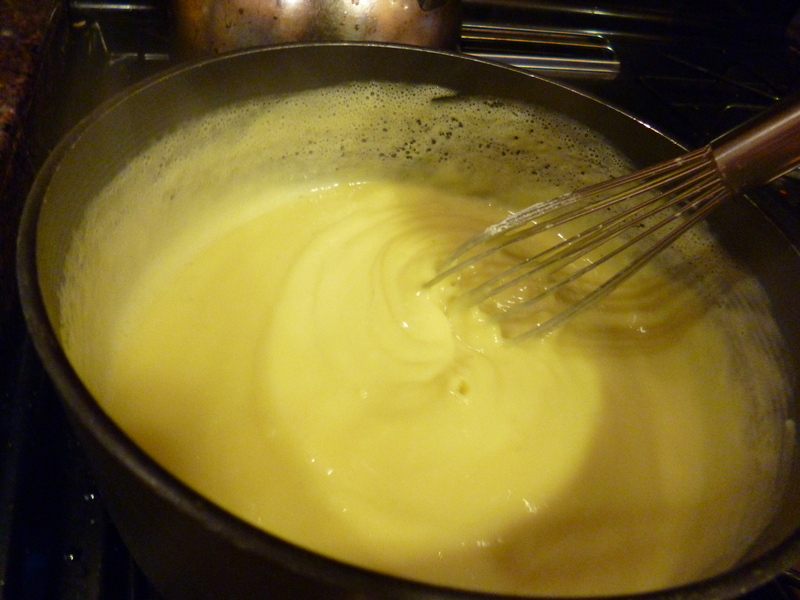 Once you’ve brought the milk (I used almond milk…) to a boil, slowly whisk in a little at a time into the beaten egg yolks + stuff. 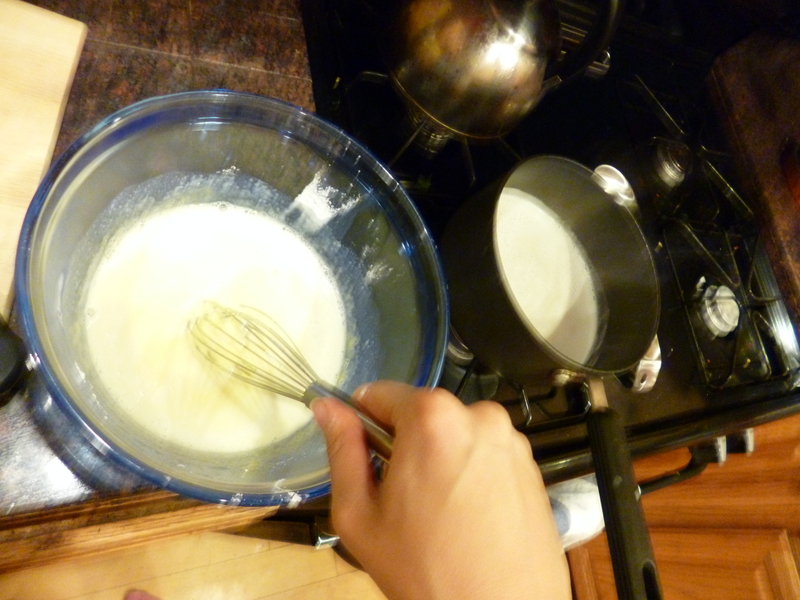 Once the bowl is warm on the bottom, then pour in the rest of the milk and whisk whisk whisk! Rinse out the pot, and throw everything back into it- it’s important to rinse out the pot so you don’t end up with burned bits of pudding in it. 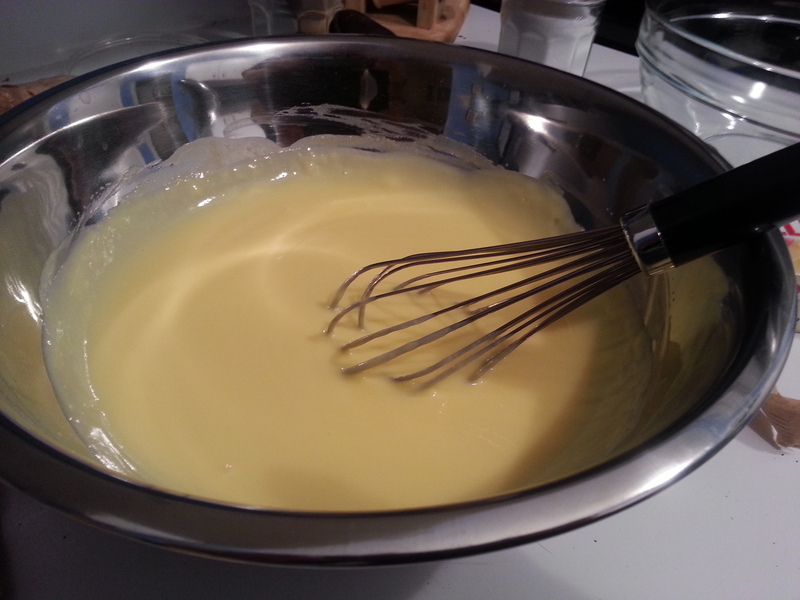 Whisk and stir the pudding over medium heat until it turns glossy and thick. Some websites say it’ll take 15 minutes; it took me more like 3. 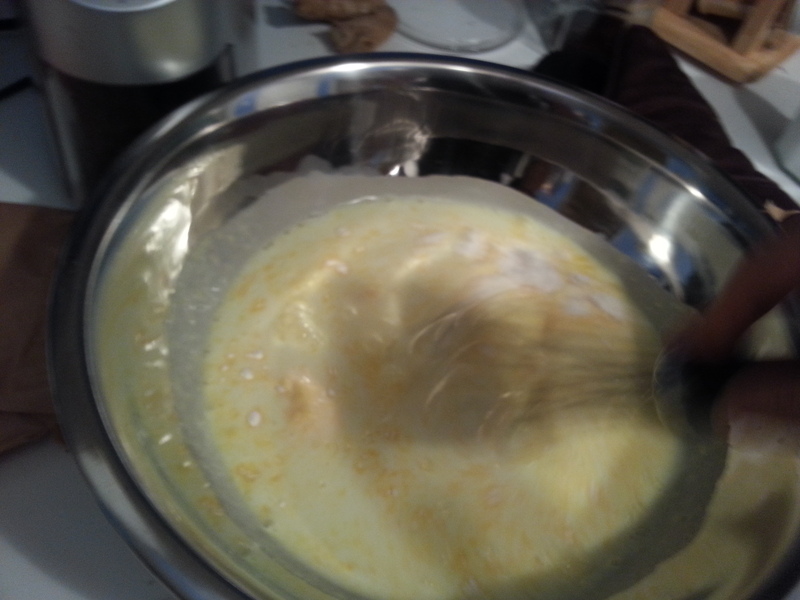 Then toss in the butter and vanilla and whisk those in. Also throw in some Kahlua or other alcohol if you want. 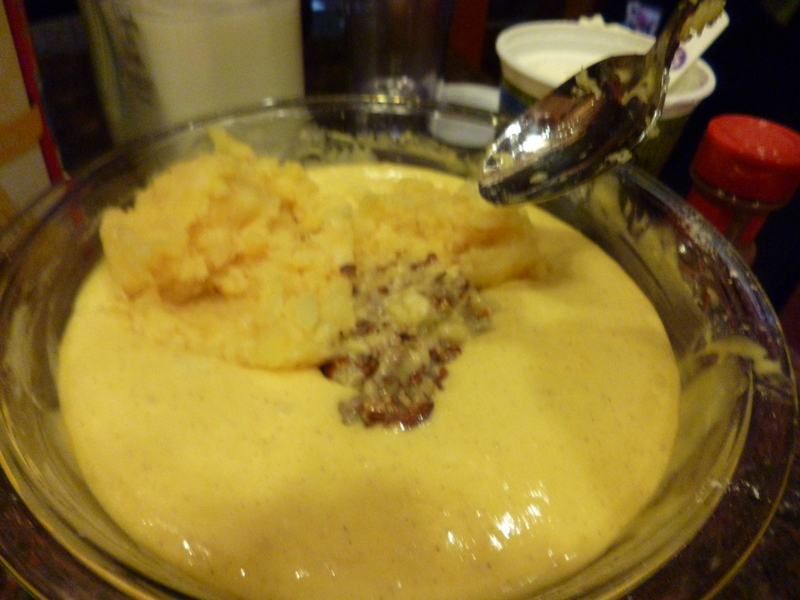 I loved the Kahlua flavor in the finished pudding. Set the finished pudding aside in that same bowl you used earlier, and toss it in the fridge to cool while you do the rest. Until finally it’s eight times its original size, and way glossy. It doesn’t remember where it came from at all. Can you talk about an inflated EG(G)O? 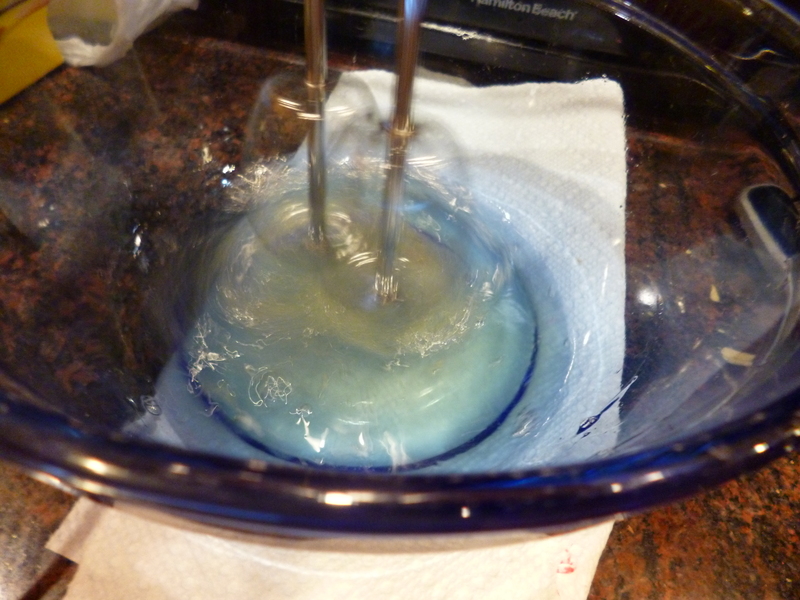 Once the meringue is done and glossy (add the sugar in around the second to last picture. 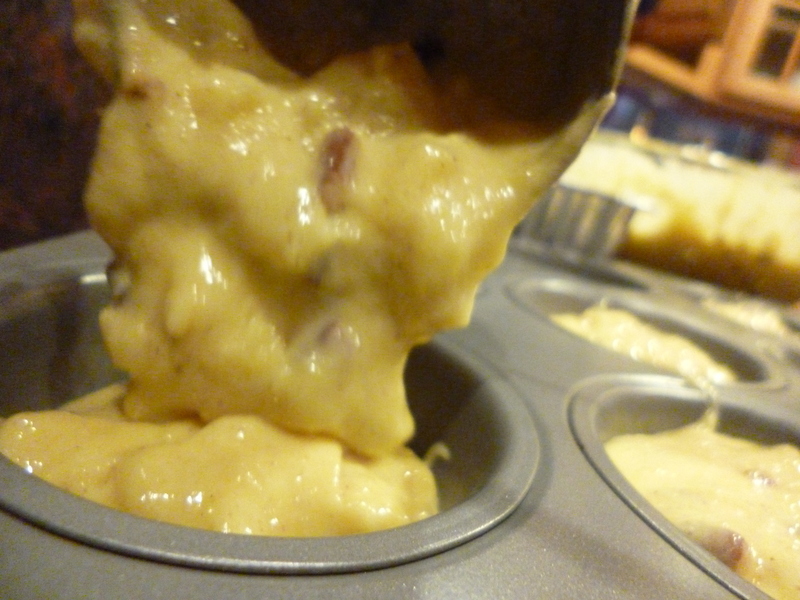 Also I did just use five captions to lead up to that last one), you can layer your pretty pudding! I used a 9″x13″ pan because I wanted a pretty glass sides thing, but I wish I had an 8″x8″ or 9″x9″ glass pan so I could have more layers. 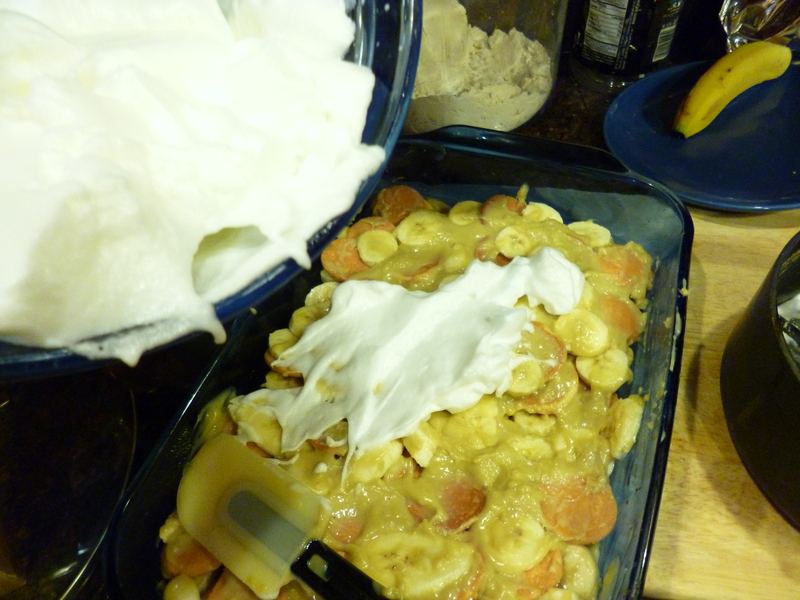 First put a little bit of pudding on the bottom of the dish, then throw on a layer of wafers, a layer of bananas, pudding, wafers, bananas, pudding, a third layer if you can, and top with meringue. Layer 1. Reticulating splines. Sim City reference, anyone? It would be so great if men were from marshmallow. Maybe not. I’d never keep a relationship for long because I’d eat him. OK! Wish me luck on a recovery before Christmas from this bug. I went to the doctor on day 5 and she sent me home with Mucinex, but I’ll go back tomorrow and see what she says. Seriously this pudding is so yummy. ALSO HERE IS ANOTHER JOKE IT IS SO FUNNY. IT IS SO FUNNY. 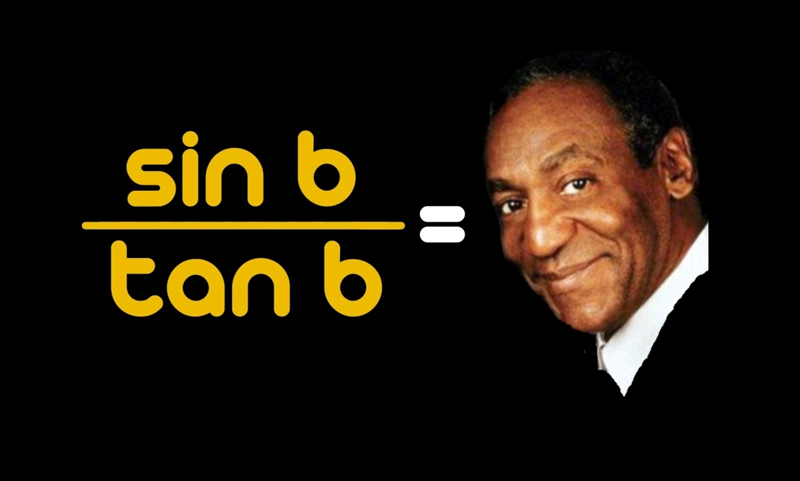 Also this picture is all over the internet so I couldn’t figure out how to attribute it. Separate the eggs. 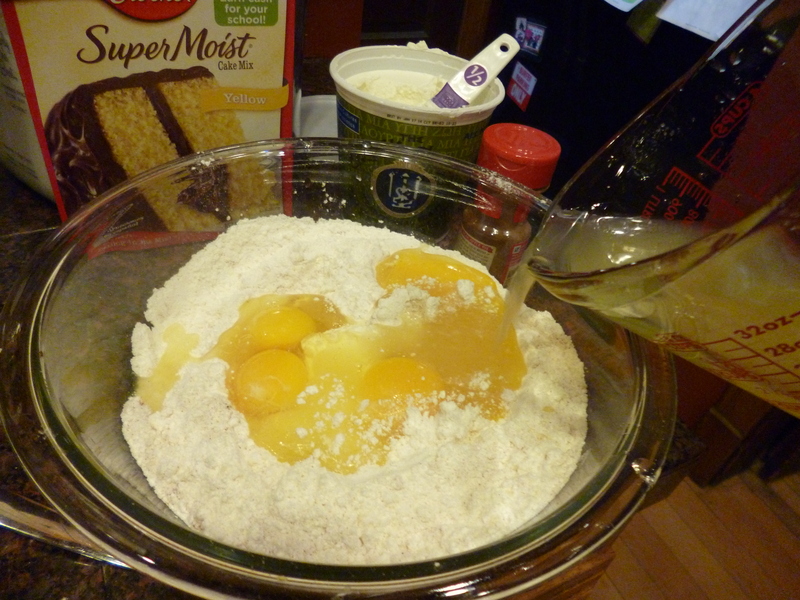 Put the yolks in a big bowl and beat in 1/2 c of the sugar and all the flour; put the whites in a separate bowl. 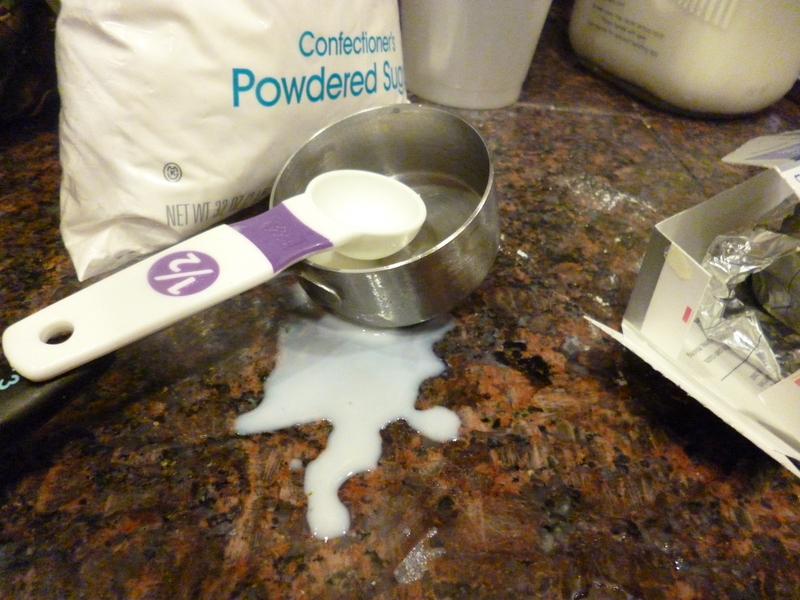 In a medium pot, bring the milk to a boil. 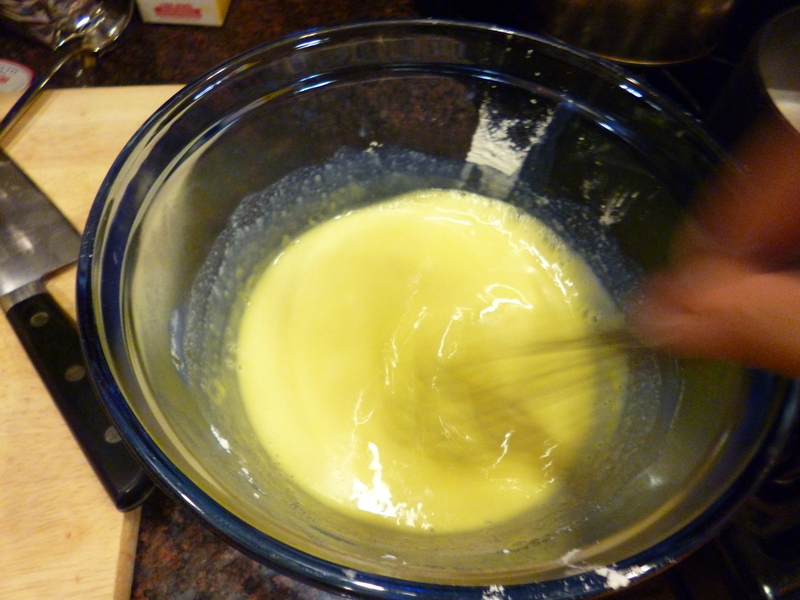 Slowly whisk a little bit at a time into the yolk bowl, whisking constantly, until the bottom of the bowl is warm. 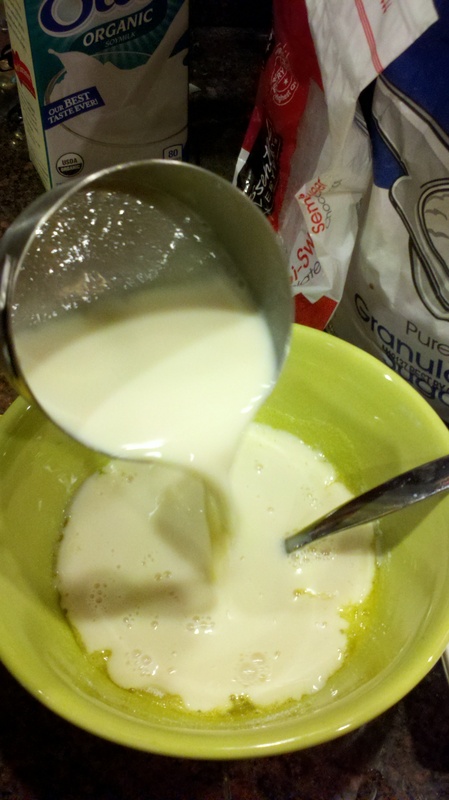 Then add in the rest of the milk and whisk away. 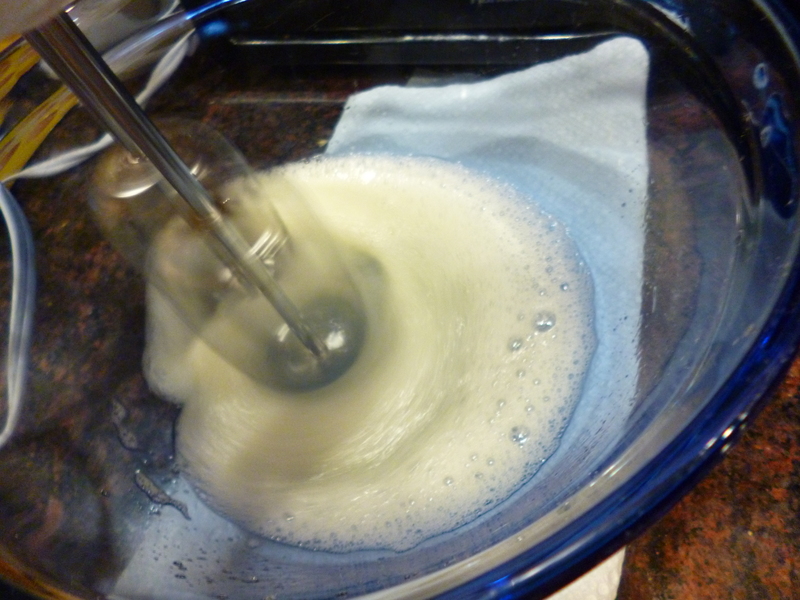 Rinse out the pot, then return the pudding to the pot and heat while whisking until it’s thickened and shiny and there are big, slow bubbles coming up. This will take a few minutes. 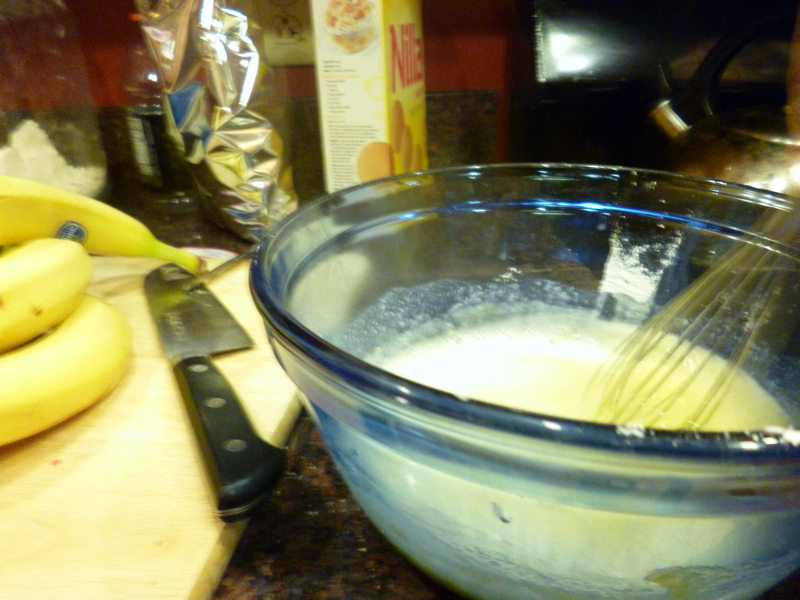 Whisk in the butter, vanilla, and alcohol. 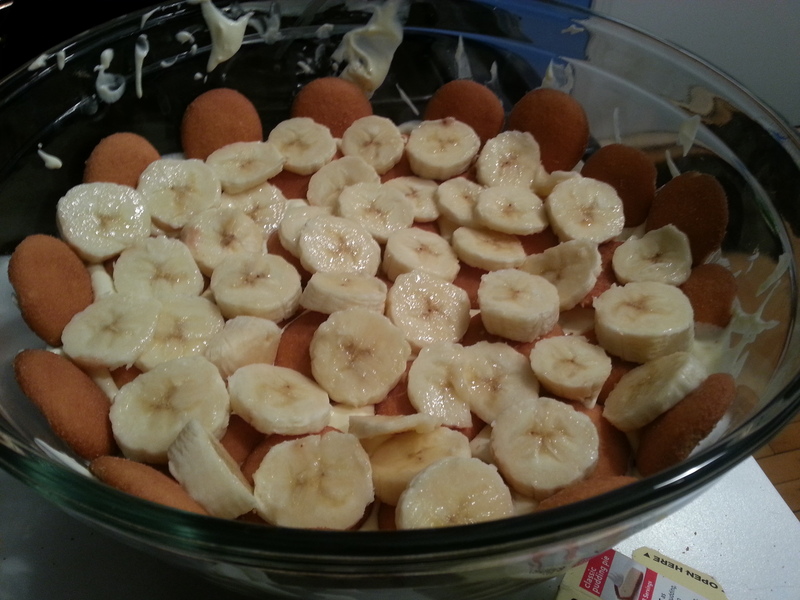 Transfer the pudding to the big bowl and throw in the fridge. 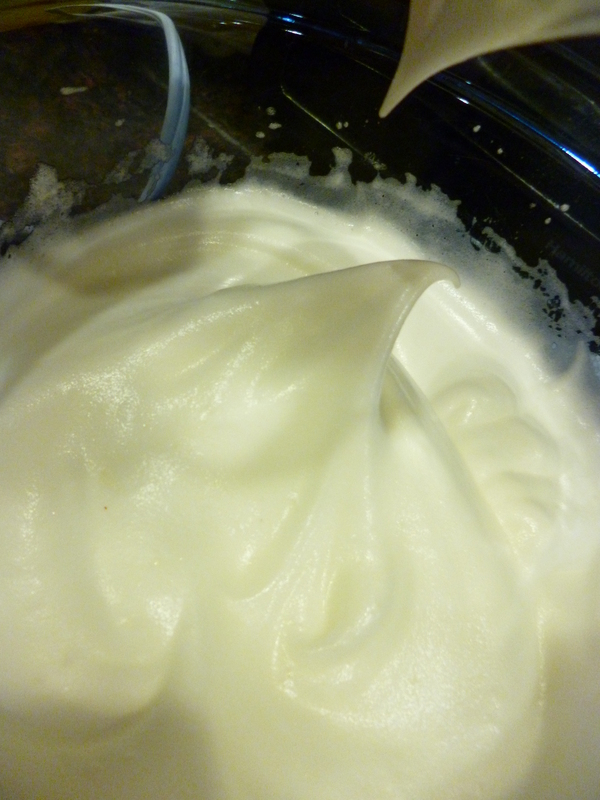 Beat the whites until small bubbles form, then disappear, and then soft peaks show up. 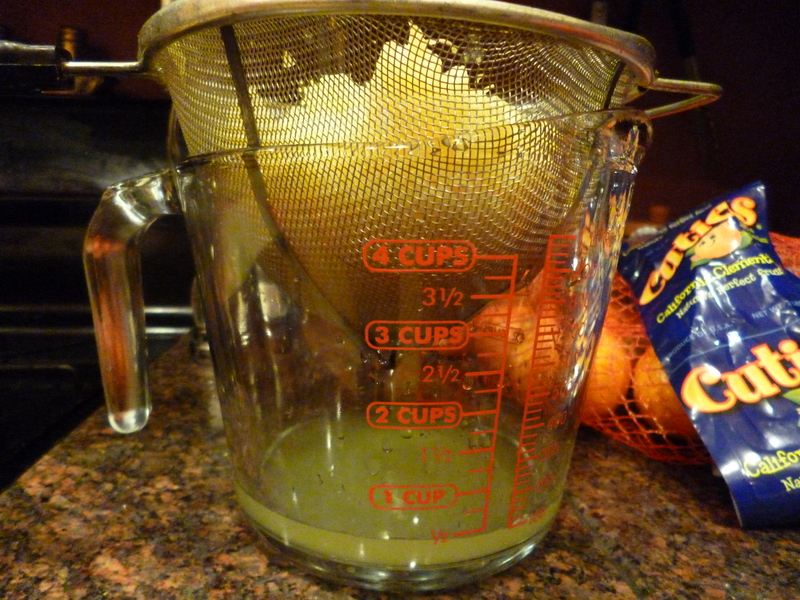 Add the remaining 1/4 c sugar. Beat until stiff and glossy. Takes 7-10 minutes. 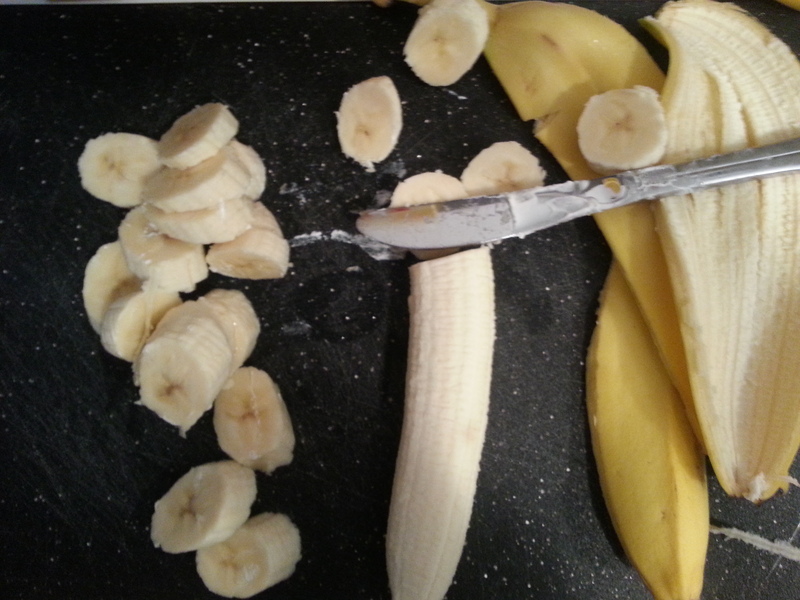 Slice the bananas. 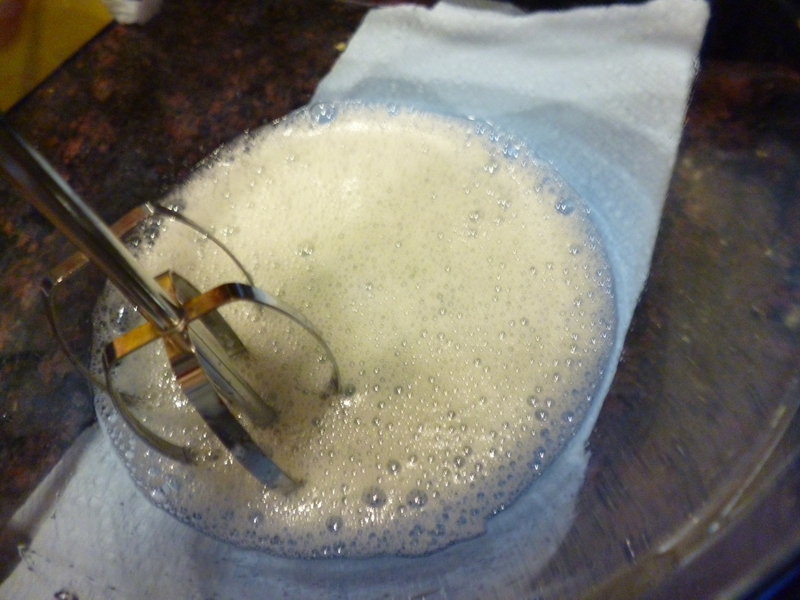 Smear some pudding on the bottom of a glass dish, then top with a layer of wafers. 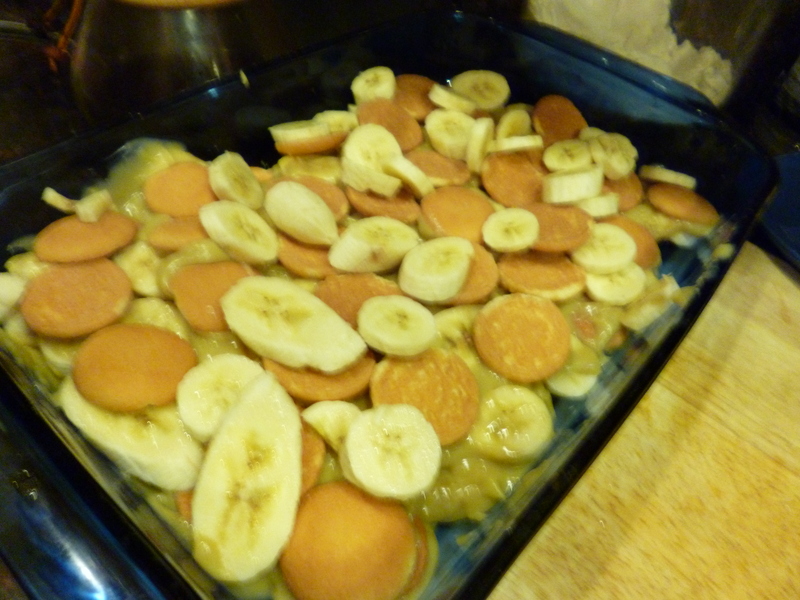 Top with bananas, then pudding, and layer until you’re out of pudding. 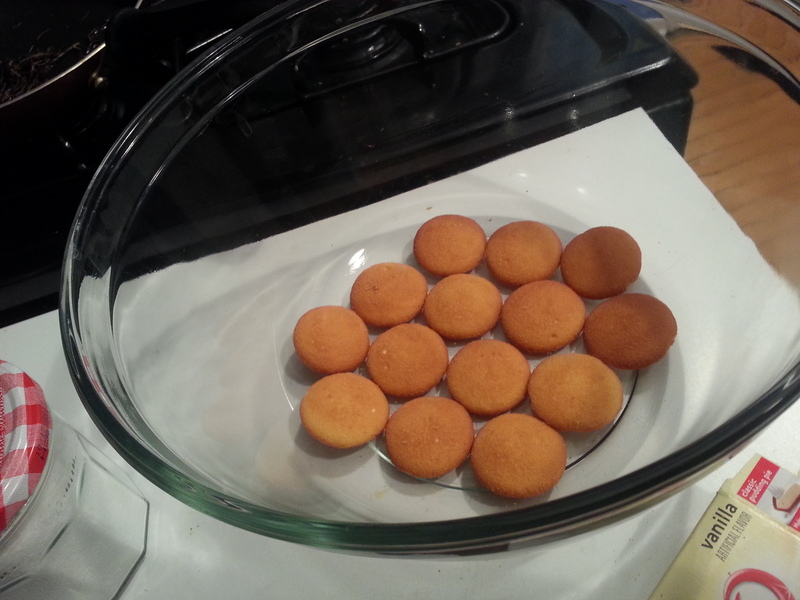 I would suggest using not the whole box of Nilla wafers- some recipes suggest using 30, some 45. I did not want to count. 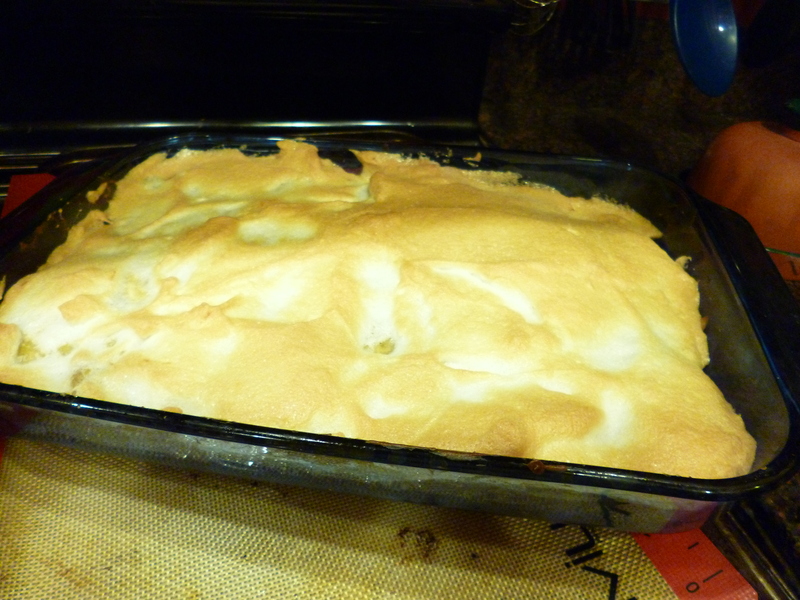 Top the whole thing with the meringue, spreading all the way to the edges. Bake in a 350 oven for 15-20 minutes or until beautifully browned. 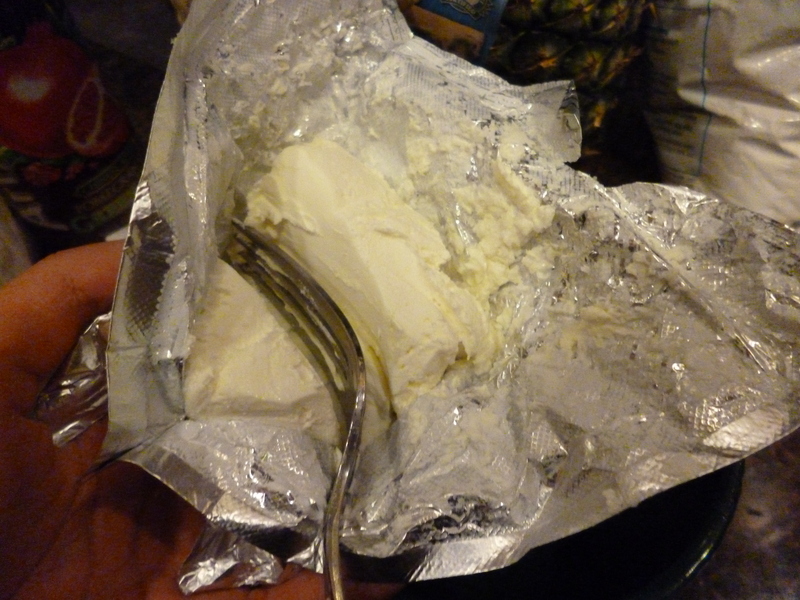 Either eat warm (cool slightly), or refrigerate for a few hours and eat chilled. SO GOOD. I’ve been traveling for the past several weekends, and this most recent weekend I ran my first-ever conference! 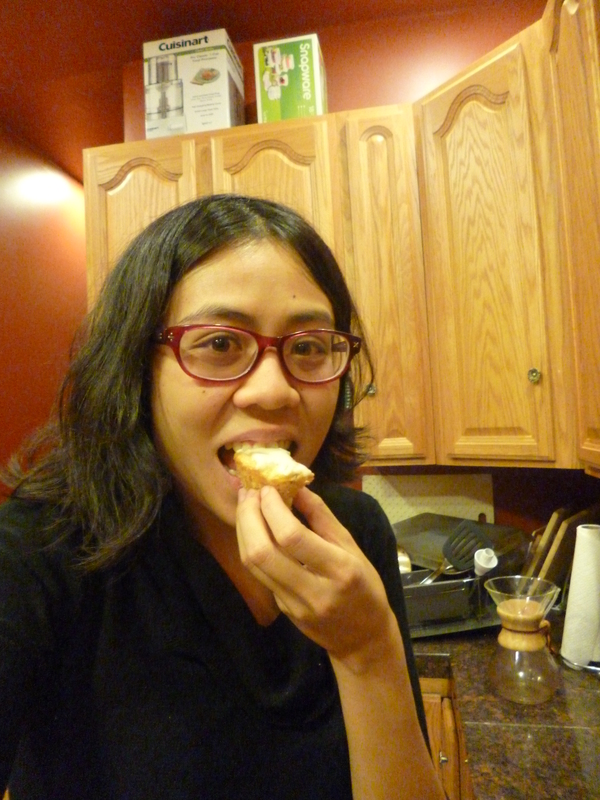 Which means that I haven’t been too consistent on this blog; I apologize for that. I need to start making backup posts and posting them during the busy weeks. It also means that I have very few ingredients at home. You might’ve noticed we’ve been baking egg-free for the past several weeks. I LOVE eggs. And not just because they’re eggstremely amenable to puns (well, not eggsactly). When I went to the store last week, I basically only got eggs and zucchini. 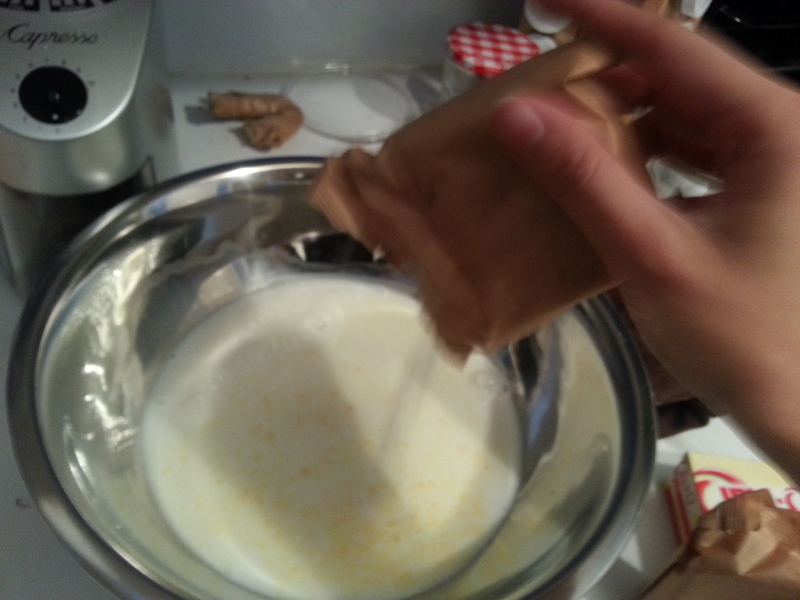 And hence last week’s baking adventure: rice pudding! (Also roasted veggies). 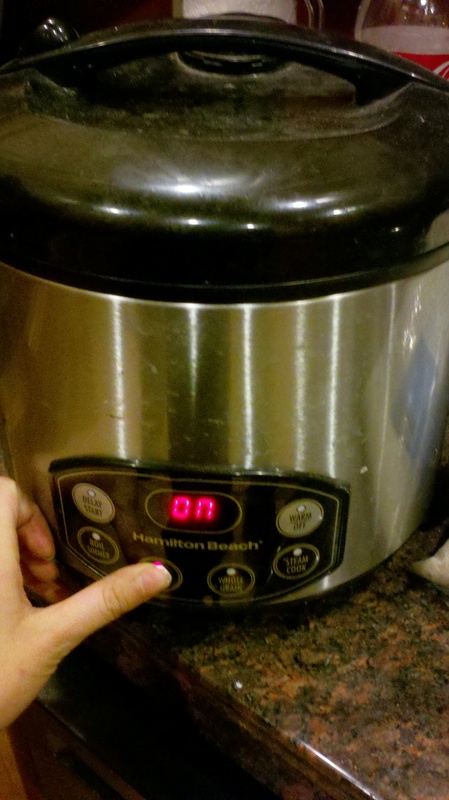 It’s very nice having a rice cooker to make your rice. 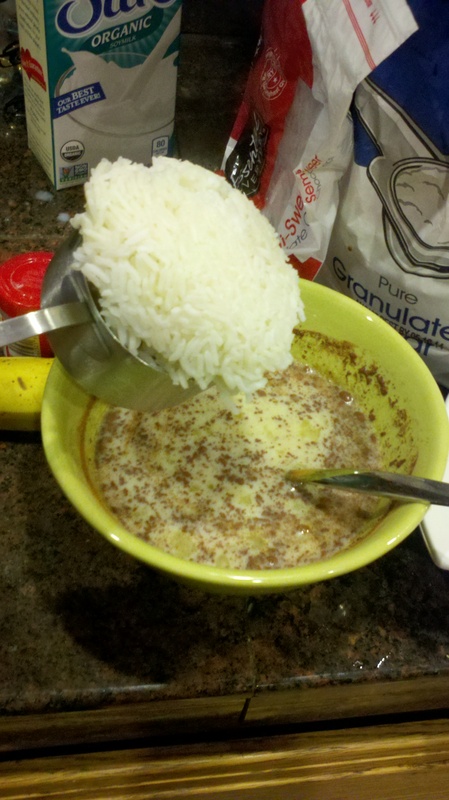 Every rice pudding recipe I’ve seen uses precooked rice, rather than cooking the rice directly in the custard. I think this dessert is for leftover rice, just like bread pudding is for leftover bread, but sometimes you just make some rice/bread for the pudding because it’s delicious. I wish it was this easy to turn anyone… I meant thing on. 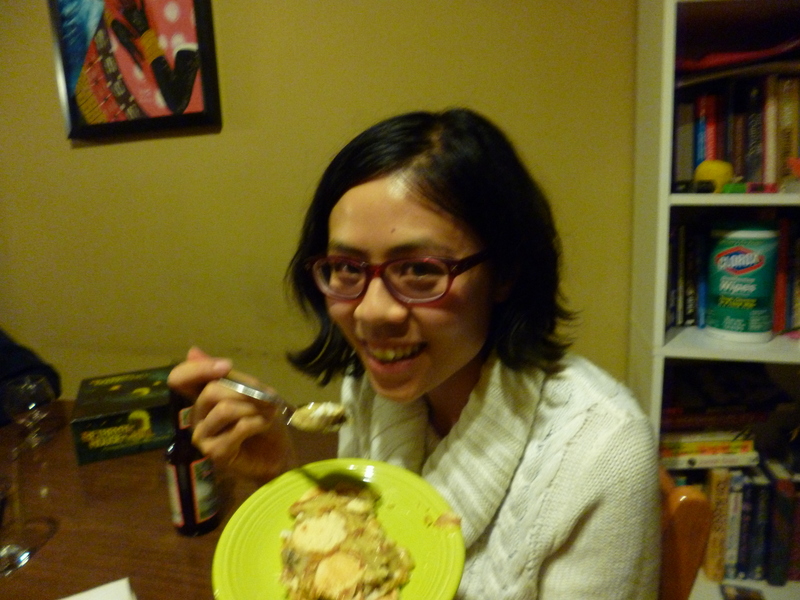 This was my first time baking rice pudding rather than making it on the stove. I did it just for you guys! 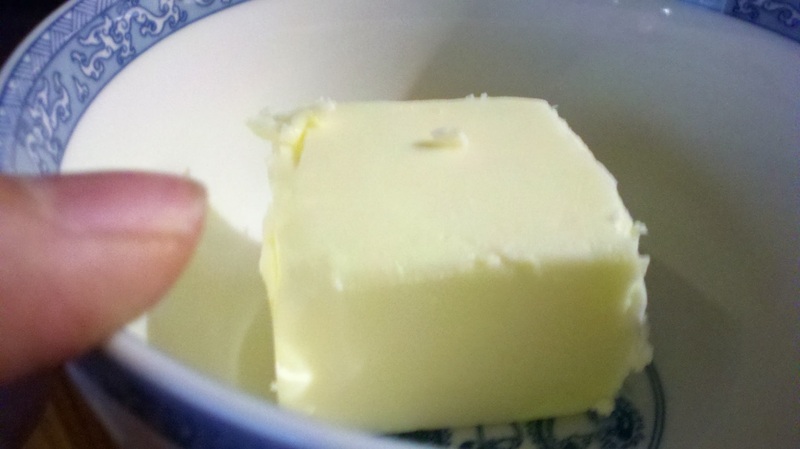 First step: butter your pan. 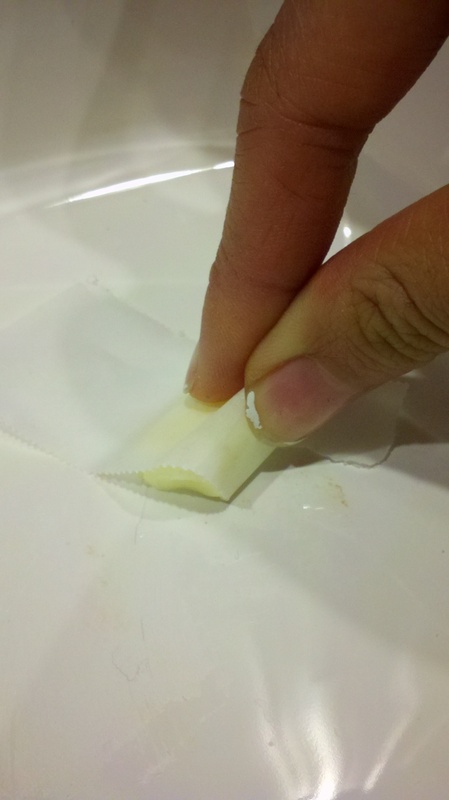 I’ve done this with paper towels and a pat of butter or oil, and I’ve also done it with my hand. The paper towels absorb too much fat, while I don’t like the oil on my hands (wash them beforehand if you do this of course. Or just generally, wash your hands before cooking.) So I’ve started using a piece of parchment paper instead. See picture. She’s got beautiful surfaces, but her size leaves something to be desired. 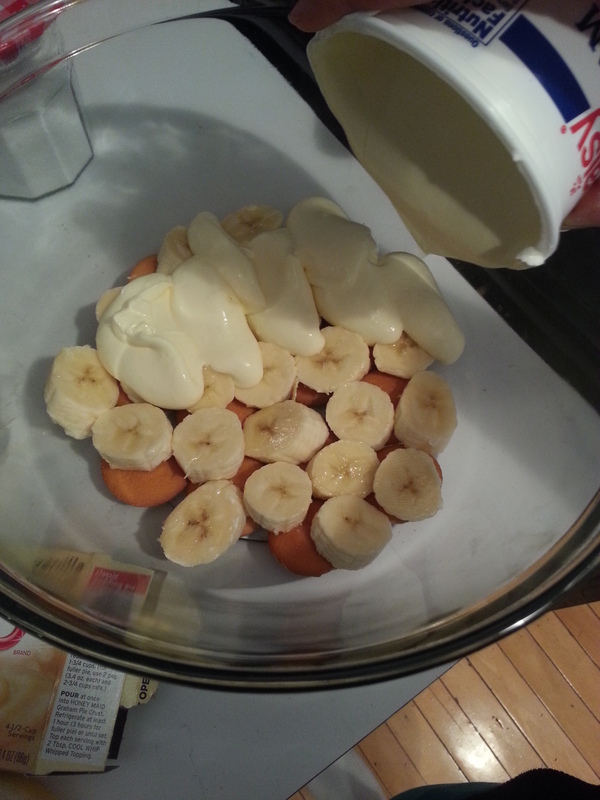 Just kidding this pan is perfect. The seven deadly cinnamons: cassia, Vietnamese, Ceylan, and Indonesion. Okay there’s four I lied. So sue me, mon. 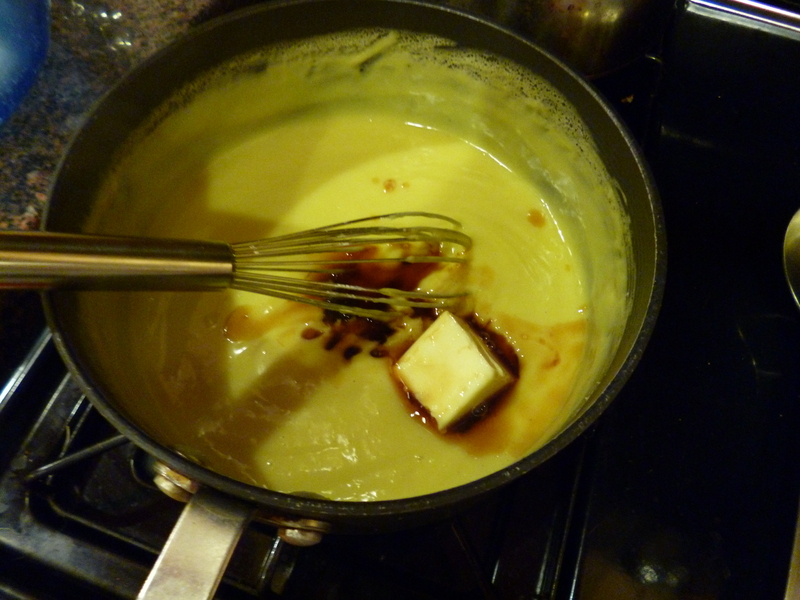 And mix that custard well. 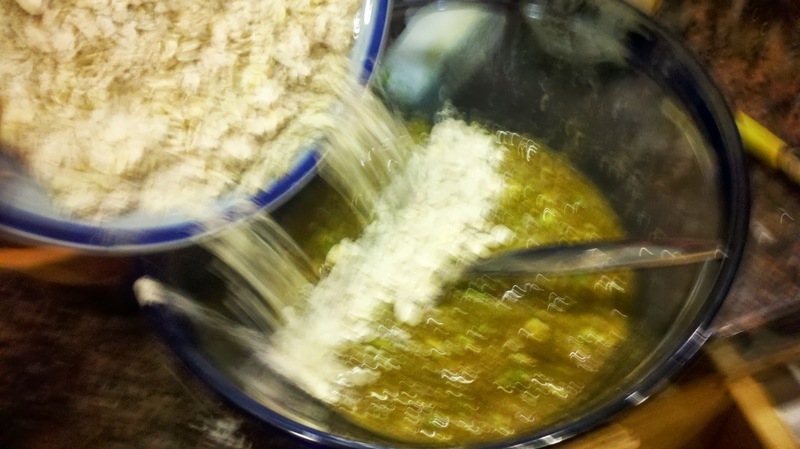 Then add your cooled, cooked rice. 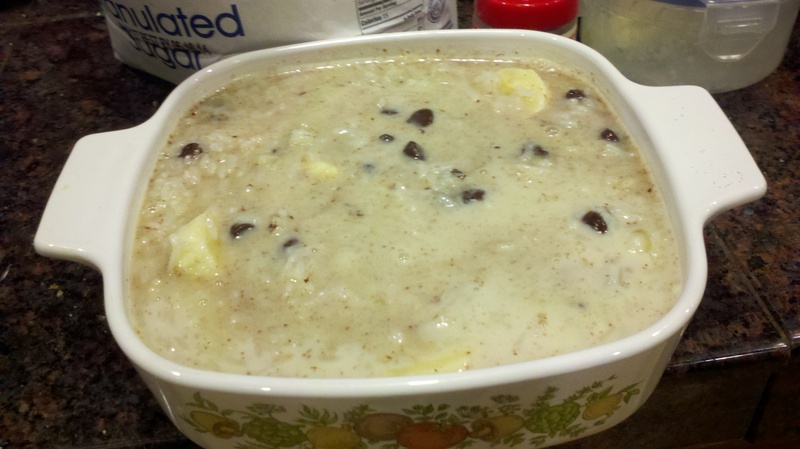 Personally I think rice pudding is best with cinnamon and raisins but guess what I didn’t have raisins so it’s banana chocolate chip rice pudding! If Orange County were in the tropics would they call them the Santa Banana winds? 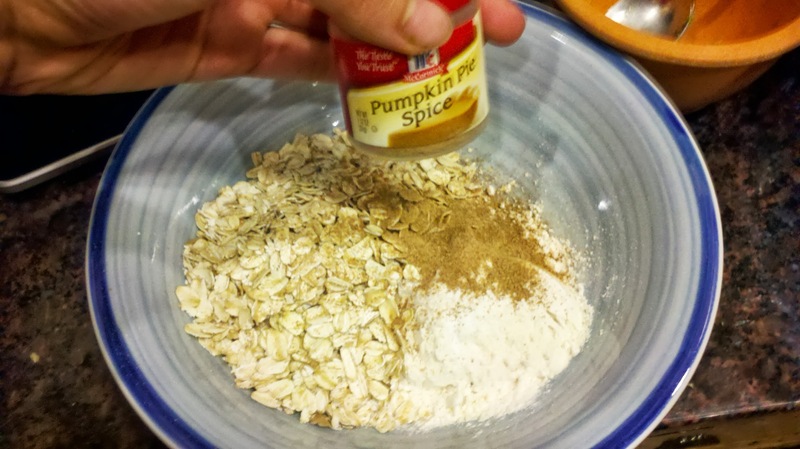 Now throw your whole mix (it should be like very thin oatmeal, thinner than you’d like to eat) into you buttered dish, and bake for an episode of TNG, or about 45 minutes. 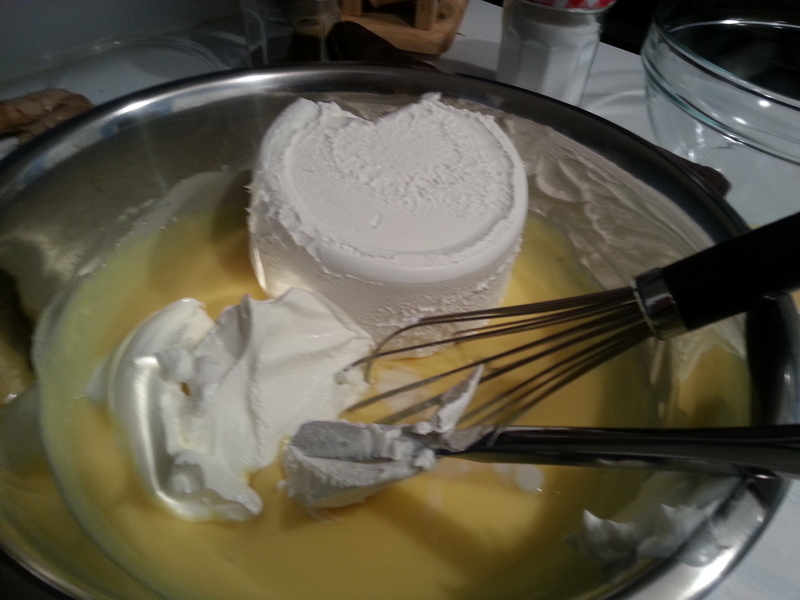 The custard should be set but still soft. 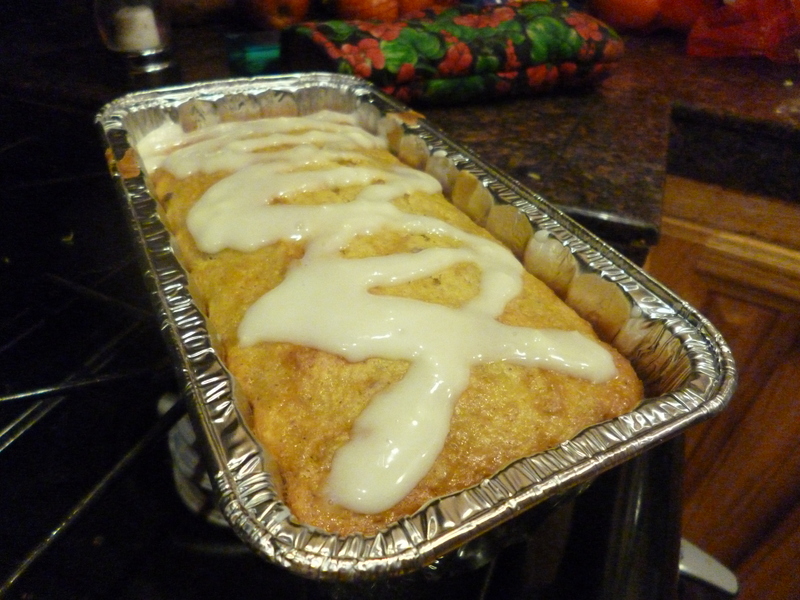 I actually overbaked mine because I forgot about it. Yours should not be as brown as below. And to be honest, I think you should do yours on the stove rather than the oven. 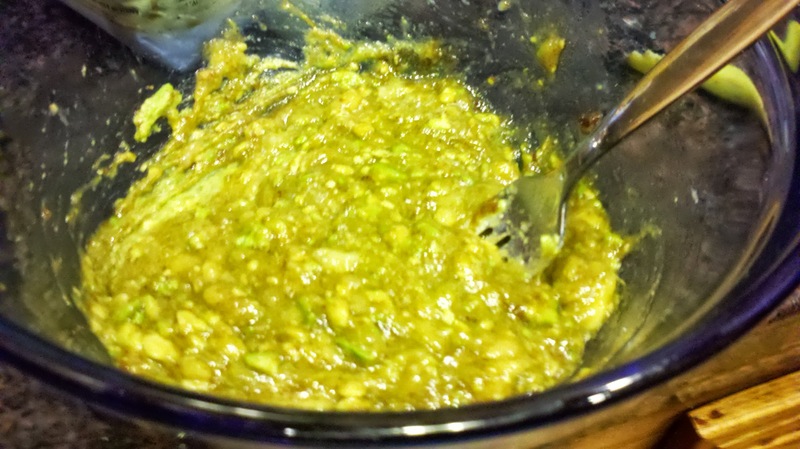 Throw the whole thing on the stovetop and simmer for 20 minutes or so. 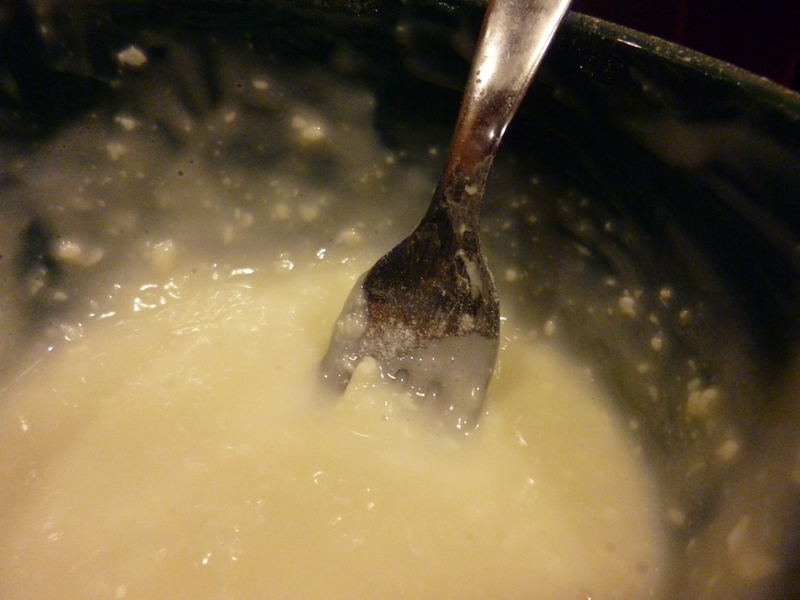 Have another 1 c of milk to stir in a few tablespoons at a time until it hits the milky creamy consistency you want. I wrote this post right after spring break and I still didn’t have a camera phone, so I borrowed the iPhone of my roommate’s friend who was staying with us, and took pictures with her phone. Then I kept pestering her to send me those pictures because she left before I downloaded them, and they are gone I guess. 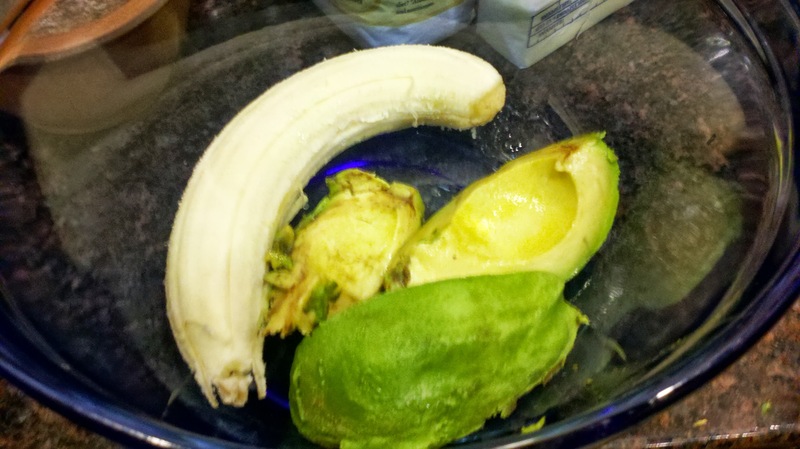 So no photos, but the recipe is pretty great so I thought I’d share it anyway. Wrapping up spring break. Yesterday I got home after being away for 12 days and I was exhausted, so I spent the day making a Pseudo-Seder feast (used wheat thins for matzoh, spaghetti squash for kugel, and this AWESOME VEGETARIAN CHOPPED LIVER made of onions, hard-boiled eggs, and walnuts) and wrapped it up with this beautiful upside down banana cake. 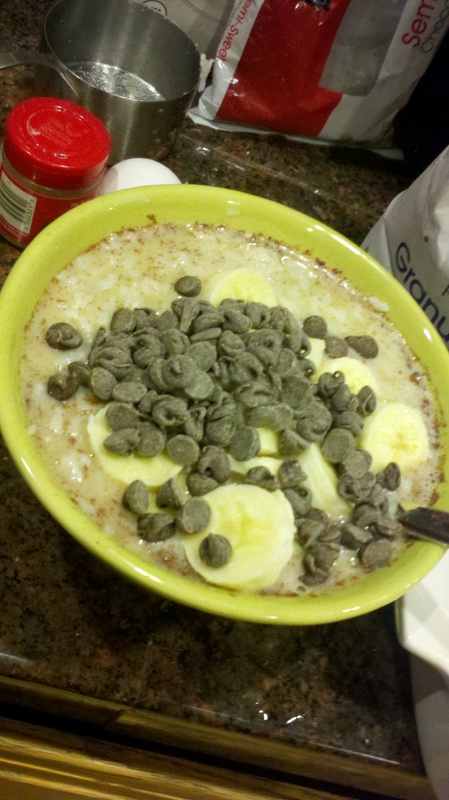 It’s much like the chocolate chip banana loaf I made a few weeks ago. My roommates liked this cake better, I liked the loaf better, who’s to say? 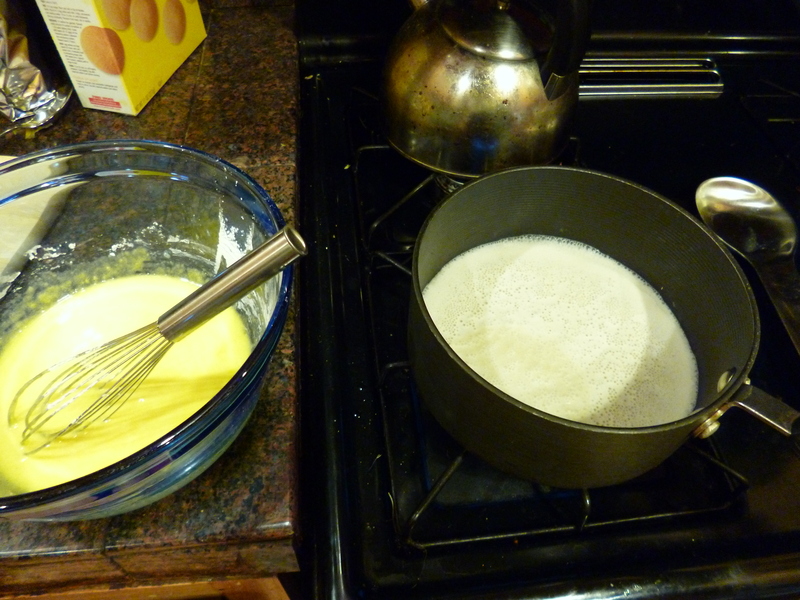 The upside down part is the best: melt some butter and brown sugar in your cake pan directly on the stove. 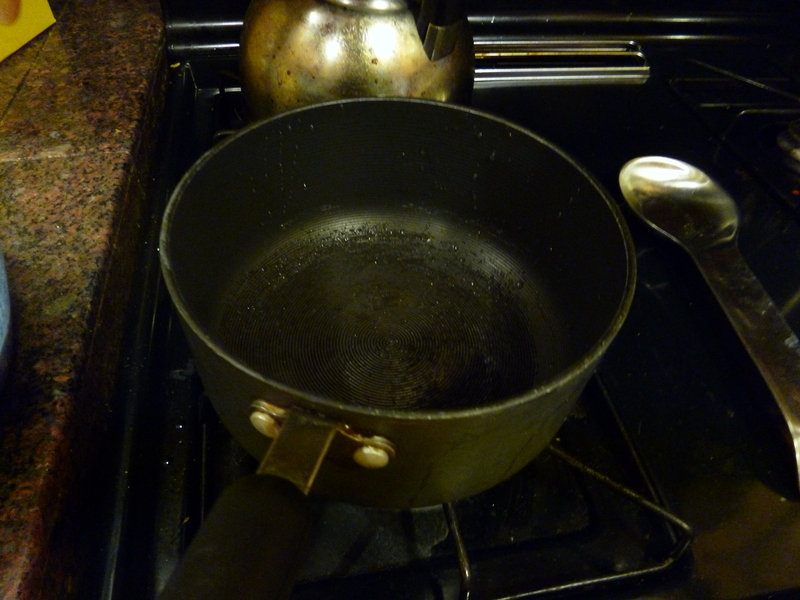 I was freaking out about putting Pyrex on top of my gas burners but it worked so yay! 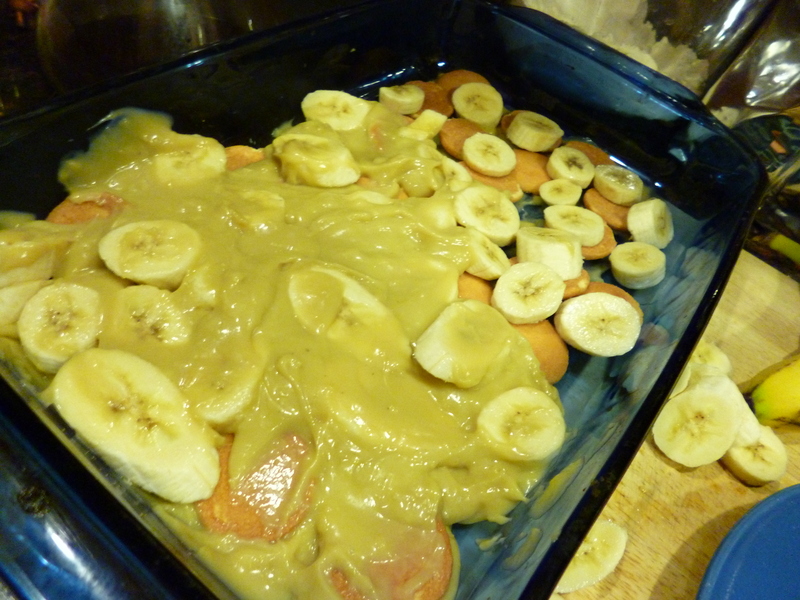 Then slice up a banana or two and arrange them artfully on the caramel-y layer. 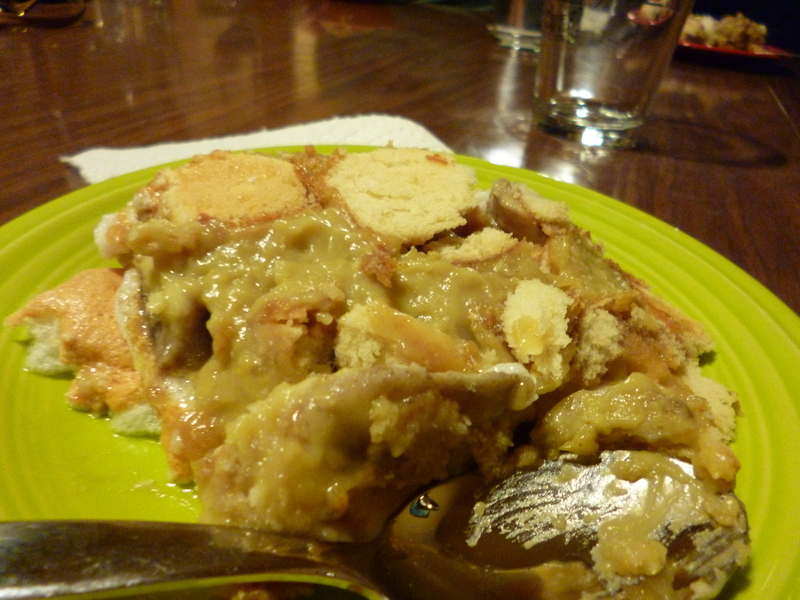 It’s okay if there’s patches in the butter-brown sugar bit, they’ll melt away as the cake bakes. 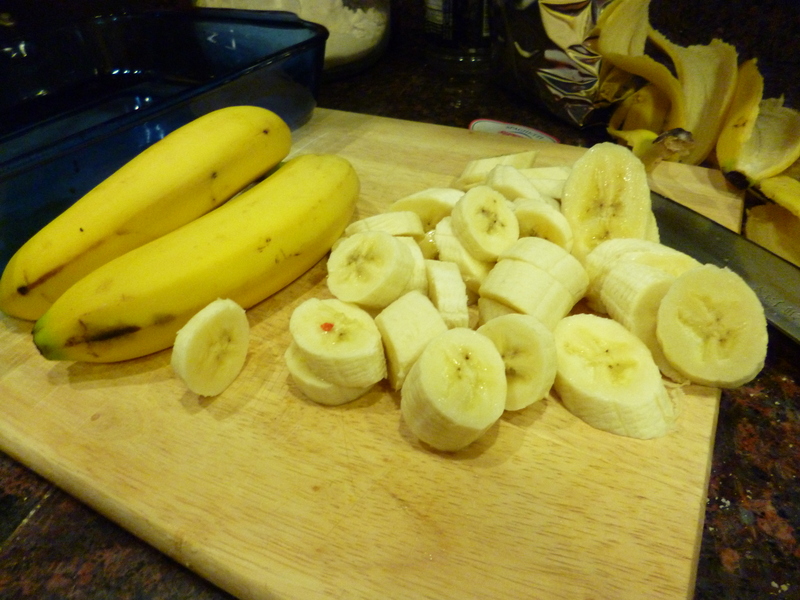 Sprinkle a little lemon juice on those cut up bananas. Next, put together your dough. 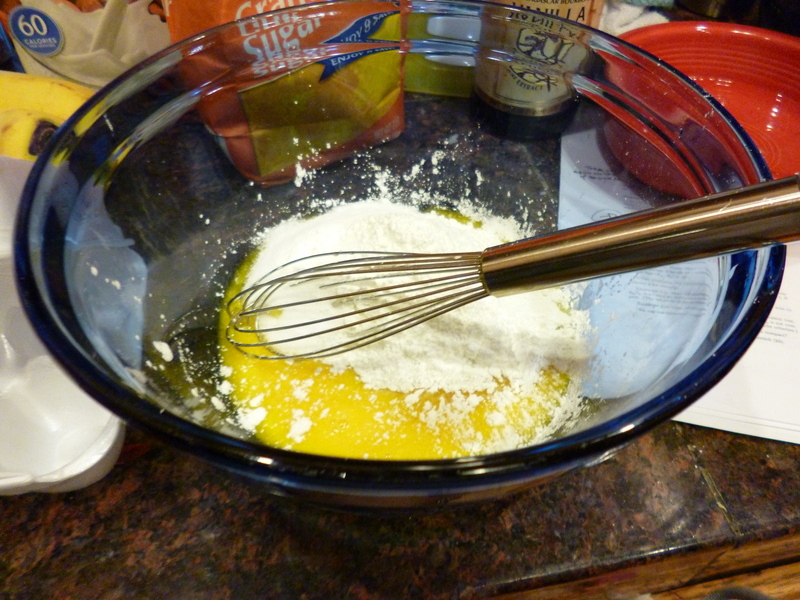 As per usual, you’ll whisk together your dry ingredients- flour, sugar, salt, baking soda, baking powder. 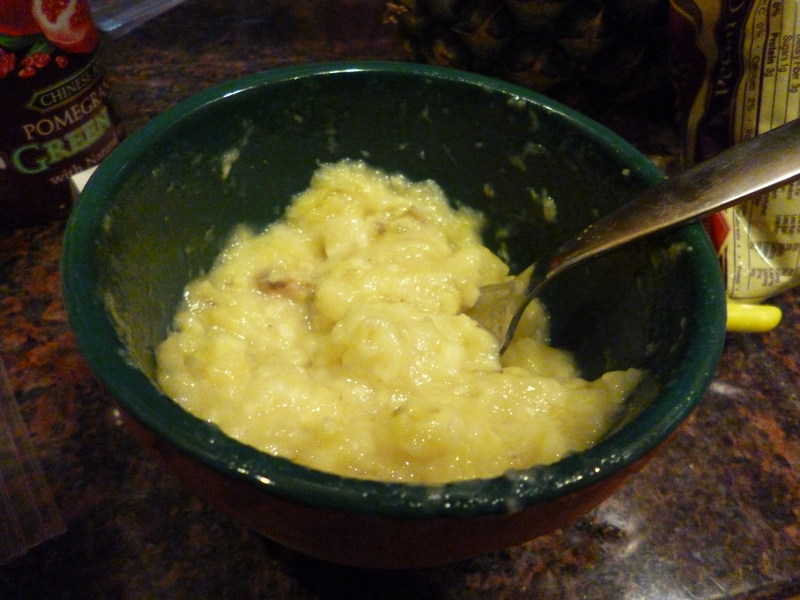 Melt a bit of butter (I love the microwave), then mash or blend two bananas. 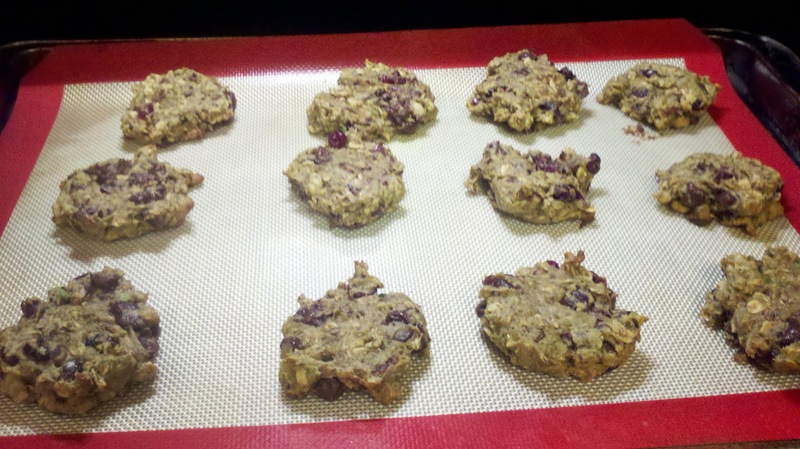 I didn’t have any frozen ones this time so I used fresh, slightly ripe ones. 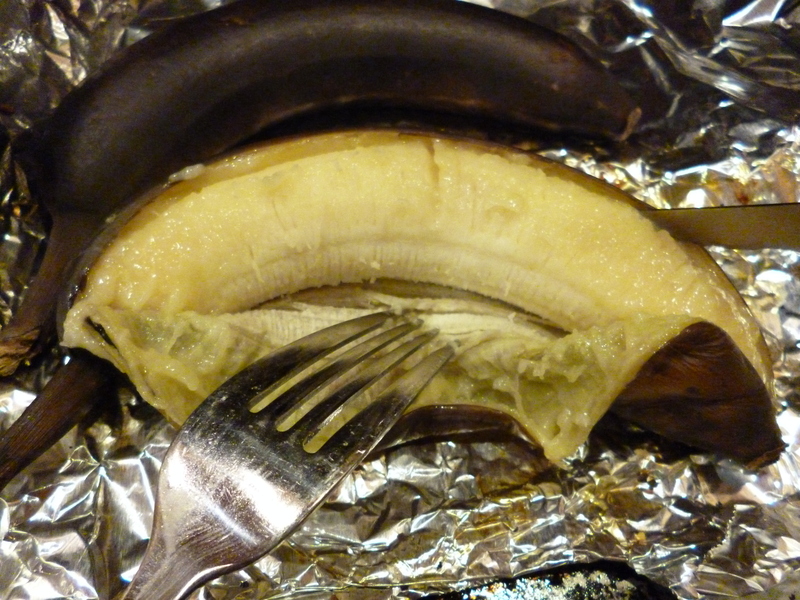 It’s far better with overripe bananas: more banana taste and more moisture. 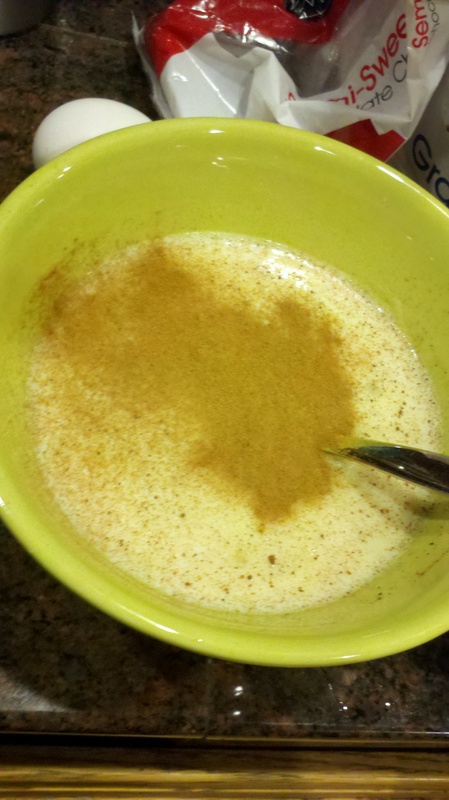 Stir in a splash of vanilla, two eggs, and some greek yogurt. 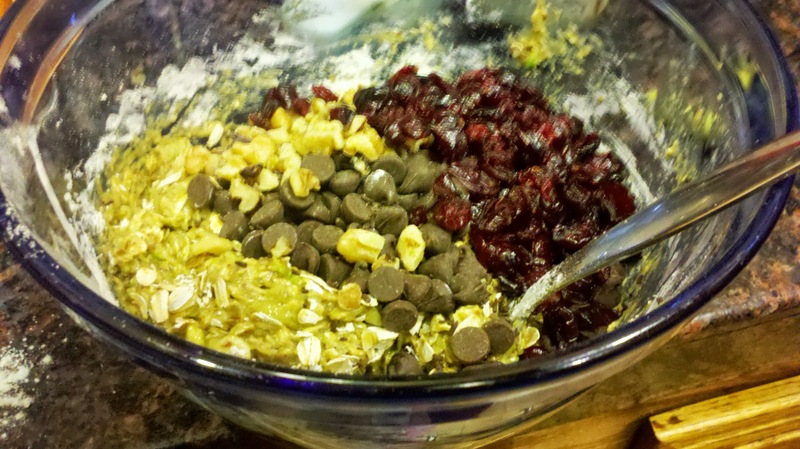 And throw in a handful or two of chocolate chips. 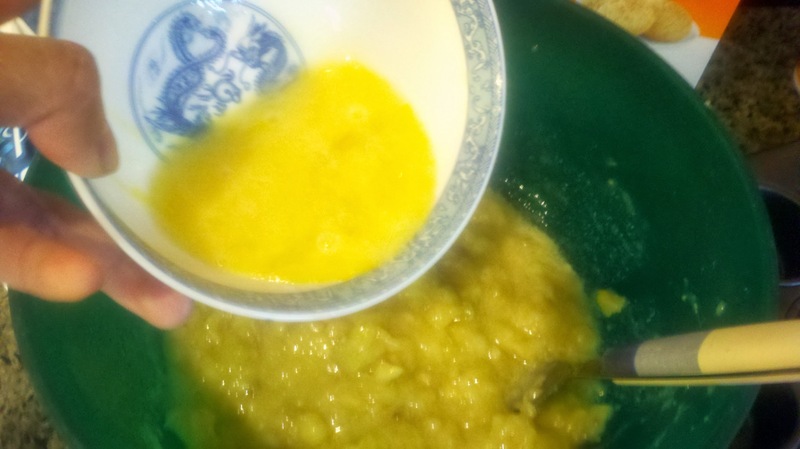 Then pour the whole batter over the topping, and chuck it in the oven. and put it in your prepared pan. 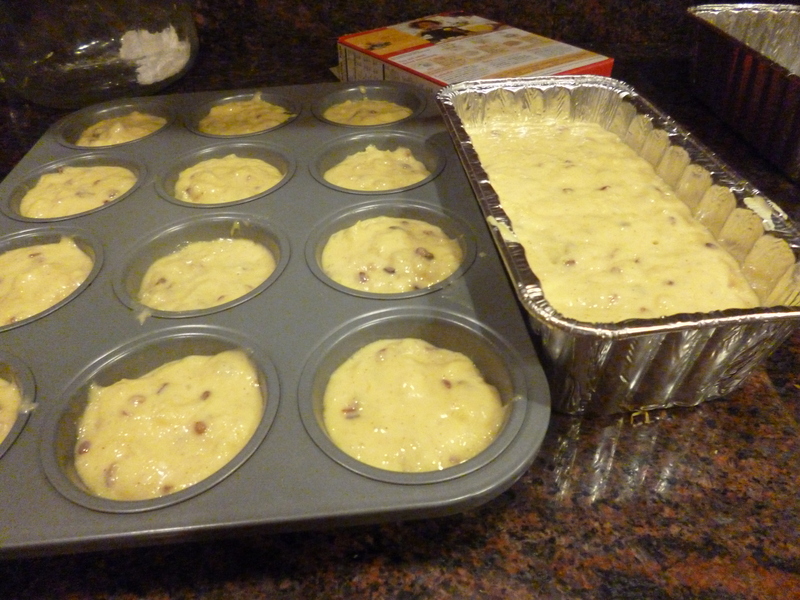 Bake at 350 for 40 minutes or so.